Please note: The testimonials written below are genuine & unaltered. We would be happy to put you in touch with any of our clients should you require verification. Who buys from Border Reivers ? Well, it just blows us away, the people who come to the shop from around the Globe, Olympic weightlifters, Premier league footballers, International Rugby players, Pop stars, Museums, Collectors, Investors, F1 Engineers, CEO’s to name a few. You never know who is coming through the door however everyone has one thing in common they are all car enthusiasts. 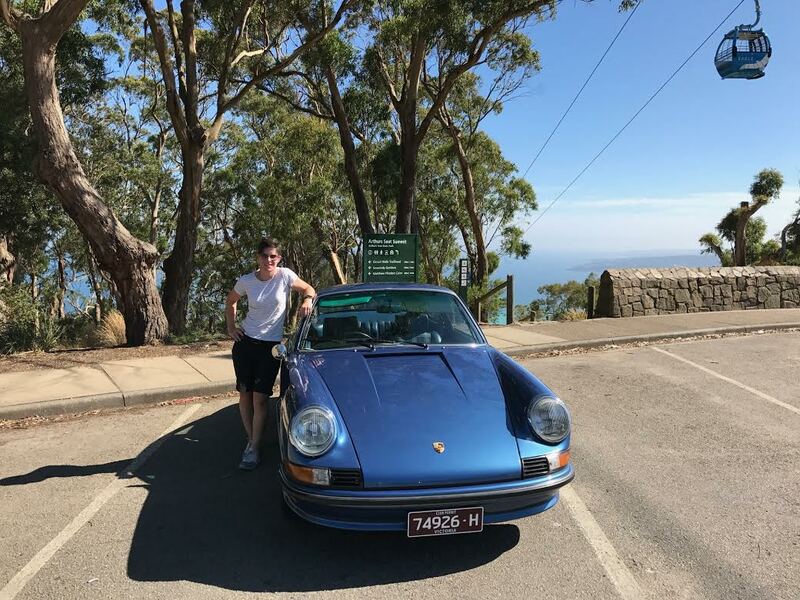 Here is my Testimonial: After viewing a few Porsche 3.2 Carrera’s, my partner and I drove up to see Tom at Border Reivers. He had a 3.2 Porsche I wanted to view. 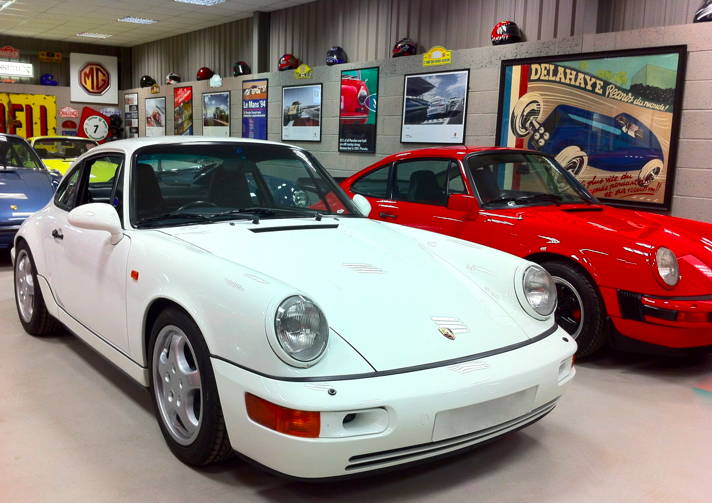 The car was lovely however I was distracted by a stunning white 964 Carrera 2 parked next to it. 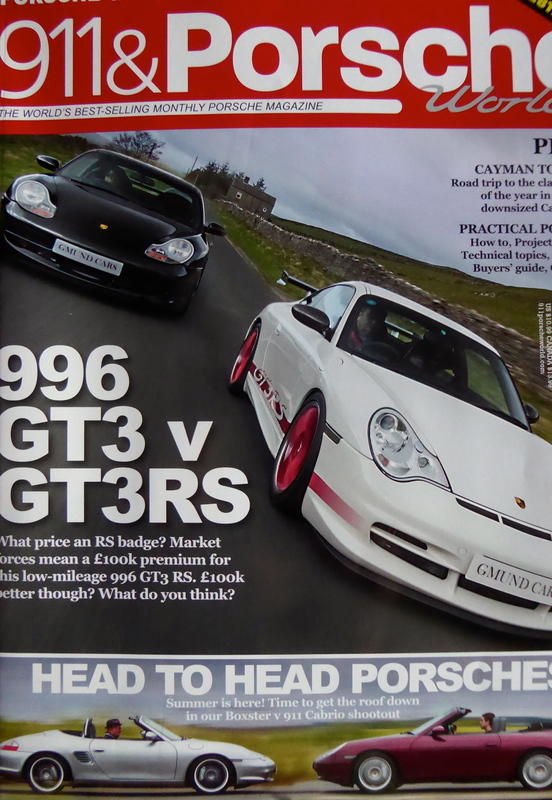 Tom allowed us to test drive both and decide which car we preferred, It was the 964 hands down. Tom is fantastic to deal with, very laid back, professional and very knowledgeable. 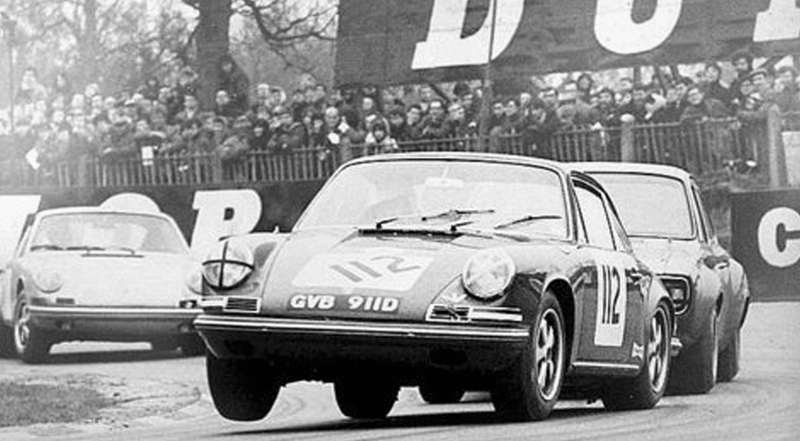 “My wife and I have wanted a vintage 911 for quite some time. Admittedly, me a bit more than my wife. 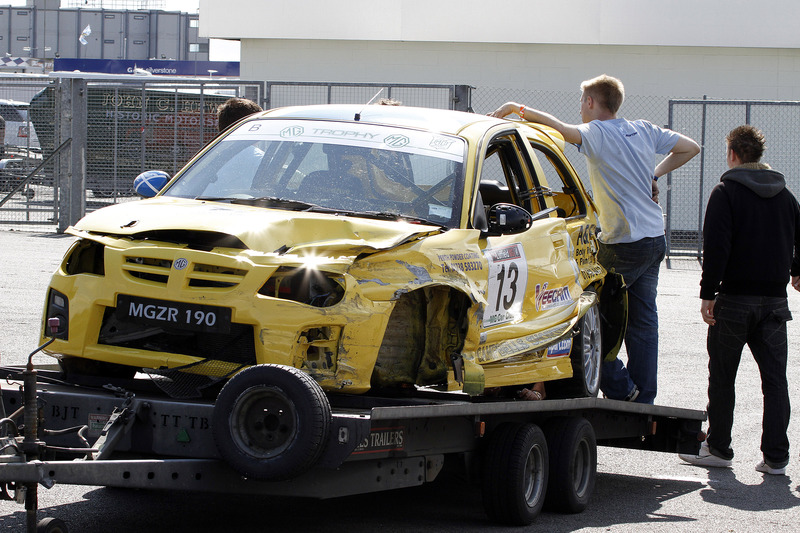 Initially we found searching for our dream car a fairly stressful experience. Especially as it turns out that neither one of us knows much, to be honest anything about vintage 911’s, (especially me). 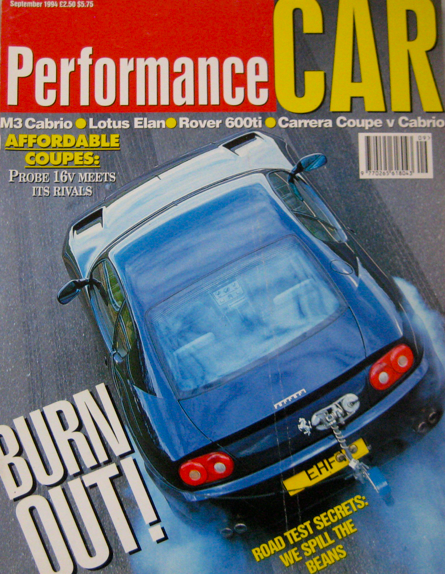 Fortunately Tom at Border Reivers was recommended to me by a mate who has bought cars from him in the past. In addition to being an incredibly patient and decent gentleman, Tom is insanely knowledgeable about everything Porsche related. All of his cars are immaculately shown. 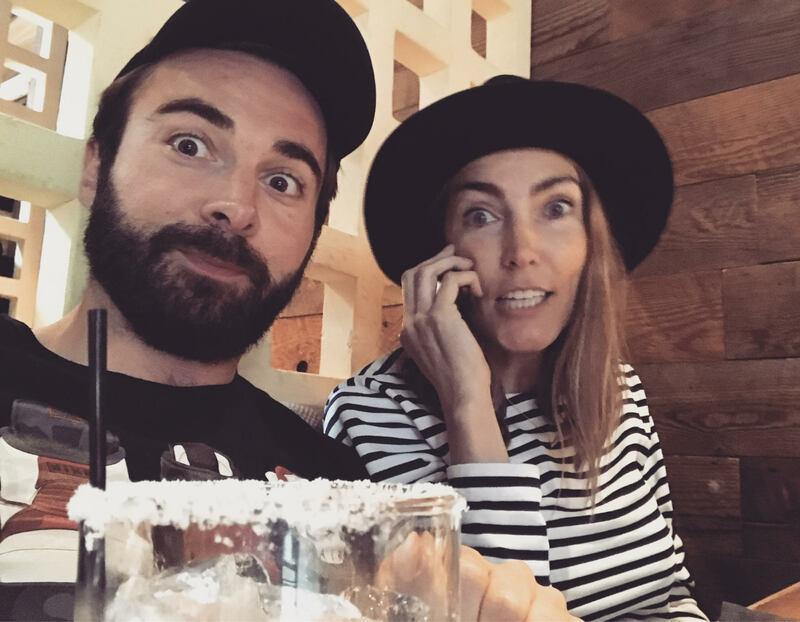 I highly recommend visiting his showroom – it’s awesome! 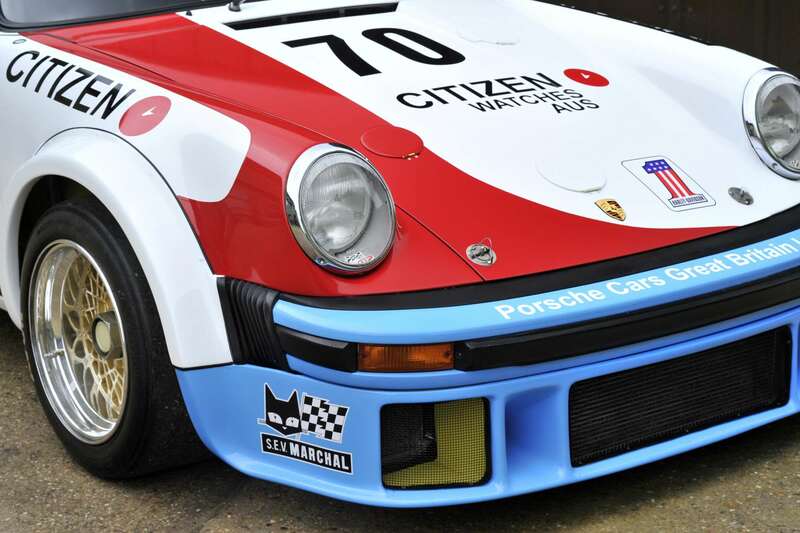 We were blown away by the level of service history that came along with our 1978 911 SC. The car runs perfectly and is an absolute pleasure to drive. Tom has also been readily available at the end of the phone whenever I’ve needed help with anything. 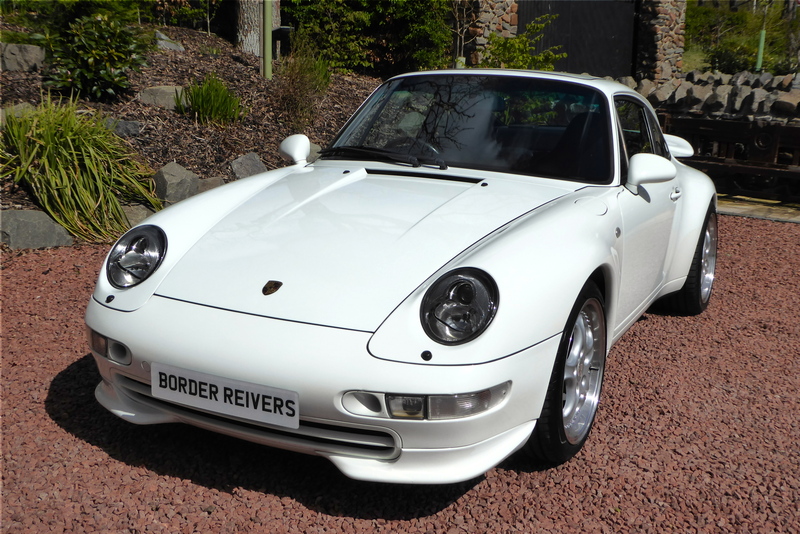 I recently had the pleasure of purchasing a 911 Supersport from Border Reivers. On first meeting Tom, it was clear that this was not just a business and the Borders Reivers team are indeed passionate about what they do. 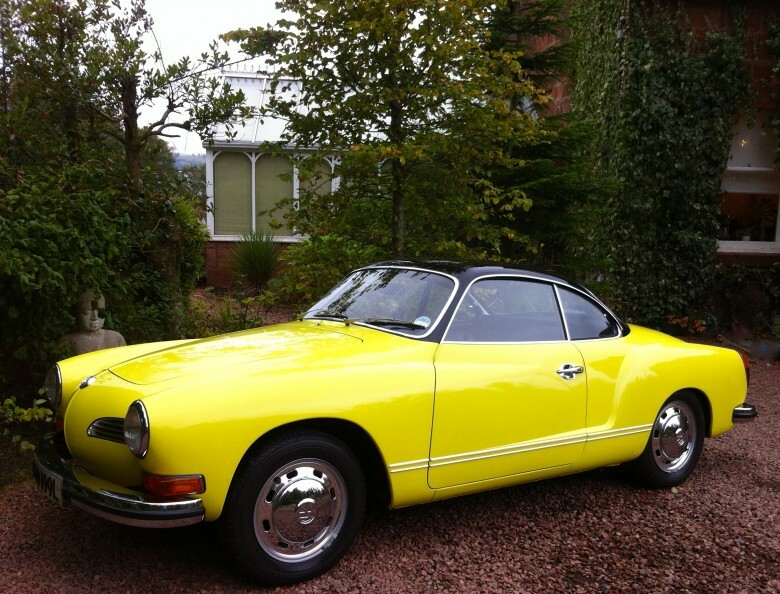 Not only are their premises set in a beautiful location, but the cars available are stunning. That’s worth a visit alone! Biggest downside to finally purchasing a car is that I won’t have an excuse to visit! 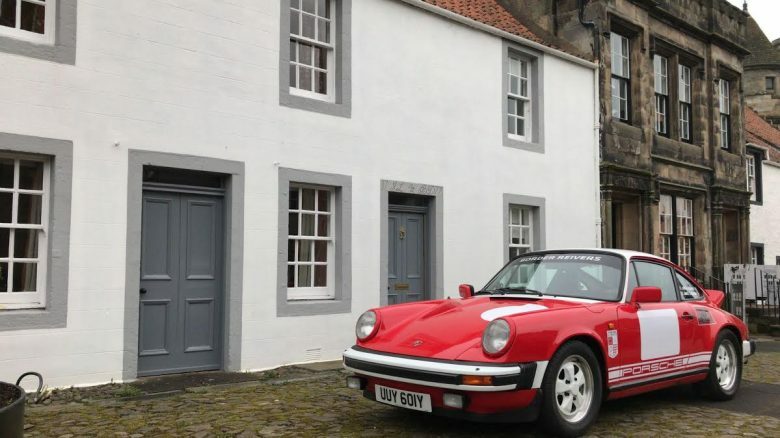 As this was my first classic Porsche, I was very sceptical about buying the wrong car, but I could have saved a huge amount of time and effort had I found Border Reivers earlier. Tom’s knowledge and expertise is invaluable; even after purchasing and taking delivery, he has still taken an interest and been on hand to answer any questions. Sorry Tom! This after sales service is refreshing and displays the enthusiasm the team have. Having someone at the end of the phone to aid any queries and offer advice, certainly adds to the overall experience. It has been a genuine pleasure and I look forward to hopefully buying from them again in the future…once a larger garage has been secured! 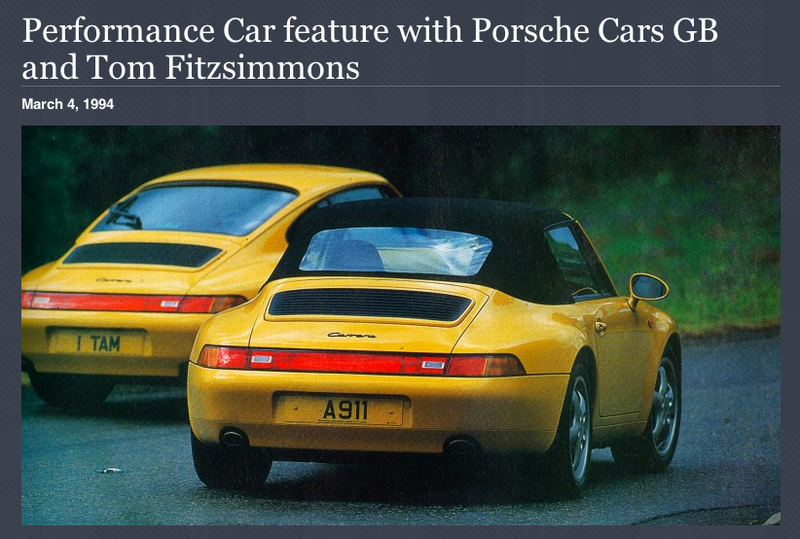 This is to state that when I visited the premises of Border Reivers, I was really impressed by the knowledge of Tom Fitzsimmons when it comes to Porsche. 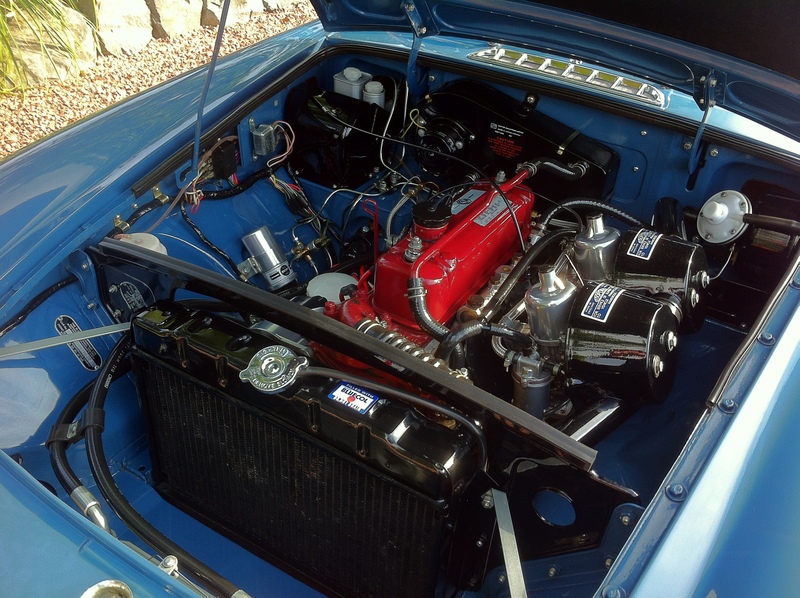 The standard to which the cars are presented is meticulous. I have been communicating with them over many years as their offerings of Porsche cars have seemed mouthwatering however one never knows by conversation alone the extent of enthusiasm and detail knowledge that Tom has put into his business,so it was a real pleasure to be there for real. I have been connected with the Porsche Marque ever since the early 60’s and have driven them internationally and for Porsche themselves over many years. 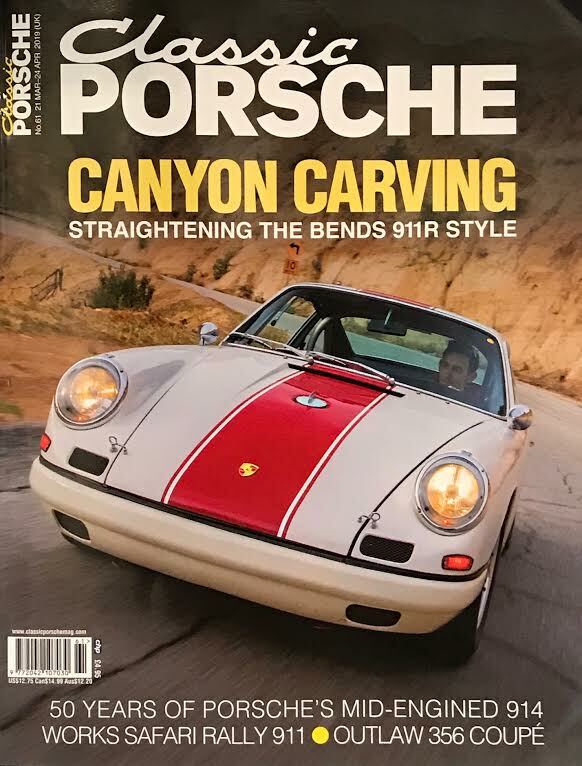 I have been buying, selling and racing Porsche for 48 years and it is a real pleasure to see such enthusiasm translated into such a passionate business always seeking perfection in the product. Porsche 356 A Bj. 1959 – sehr guter Zustand, für Rennen aufgebaut! Anzeige gefunden, sofort in das Auto verliebt – Anbieter Border Reivers?? Wo- Schottland?? Also, einen Flug gebucht nach Edinburgh und kurzer Hand auf die Insel geflogen. und auf hochwertige Autos spezialisiert. kurz vor Mitternacht nach zurück nach Glasgow gefahren. anderen Auto’s auch noch) und durften danach eine Probefahrt durch die Highlands absolvieren. und gegen Entgelt wurde der Wagen noch bis vor die Haustüre in Deutschland geliefert. Ein wirklich perfekter und freundlicher Service der nicht selbstverständlich ist. Many thanks Tom, it was great to make business with you! 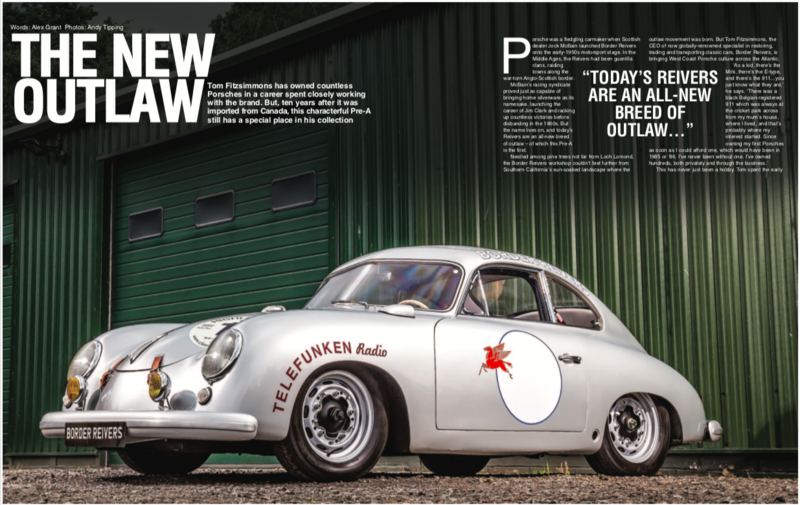 A TRIP TO SCOTLAND to view a 1959 Porsche 356A – Very good condition, built for racing! 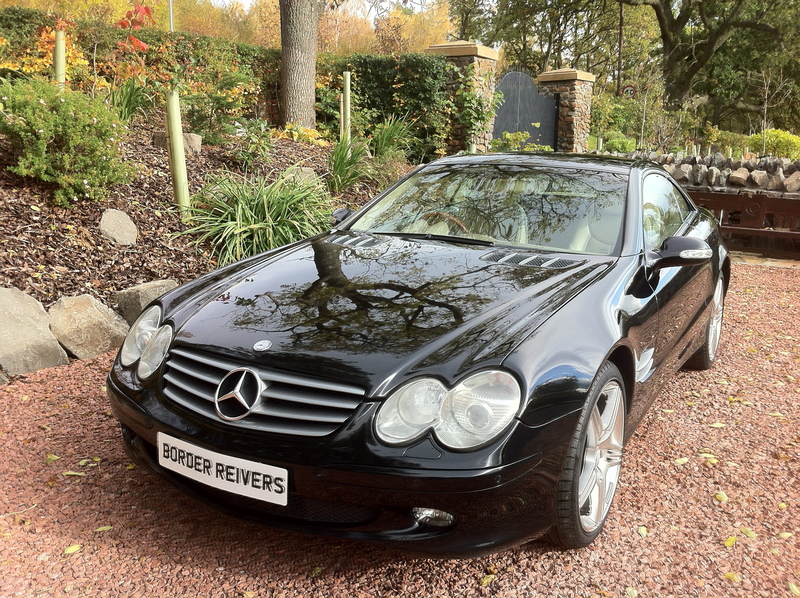 As per the add, I fell in love with the car which was offered by Border Reivers, So a flight booked flown to Scotland. Quite a bit away from idyllic Glasgow situated on a lake,is where the company “Border Reivers” hides and specialises in high quality cars. The owner – Tom Fitzsimmons is more than friendly to us and very helpful. Caters to his customers every whim. He gave us late night run to Glasgow for a meat, shortly before midnight after back after it. We were in a spotless showroom, full of the objects of desire. He gave us peace to inspect and allowed us to undergo a test drive through the highlands afterwards. We agreed the purchase and some special requests and modifications to be carried out which were done by Border Reivers. We paid for the car and it was delivered to our doorstep in Munich, Germany in a covered transporter. A truly perfect and friendly service which is not self-evident. Many thanks Tom, it was great to do business with you! I am very happy for you to use my comments as a testimonials. It is a lovely car, polished and cleaned to perfection. Thank you for tidying and preparing the car for me. I am already enjoying it and looking forward to using it more. You have been straightforward and helpful throughout which has meant a stress free purchase of a great well presented car. Had my first drive up the road in the wee Healey this morning!! Sensational is all I can say. I am still smiling!! 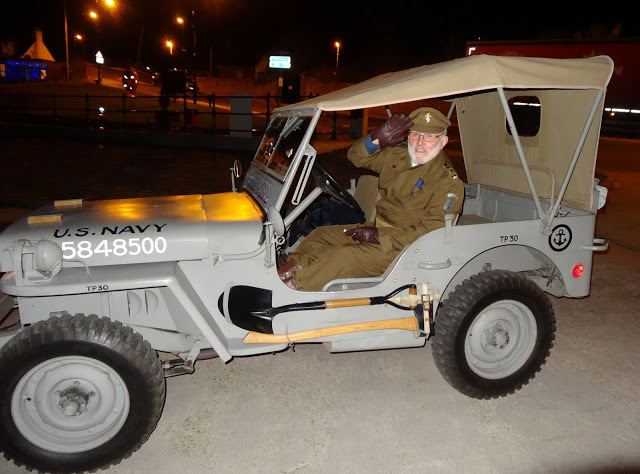 Drives so well it is hard to believe it is 64 years old!! Also made everyone who saw it on the road smile on a Monday morning!! 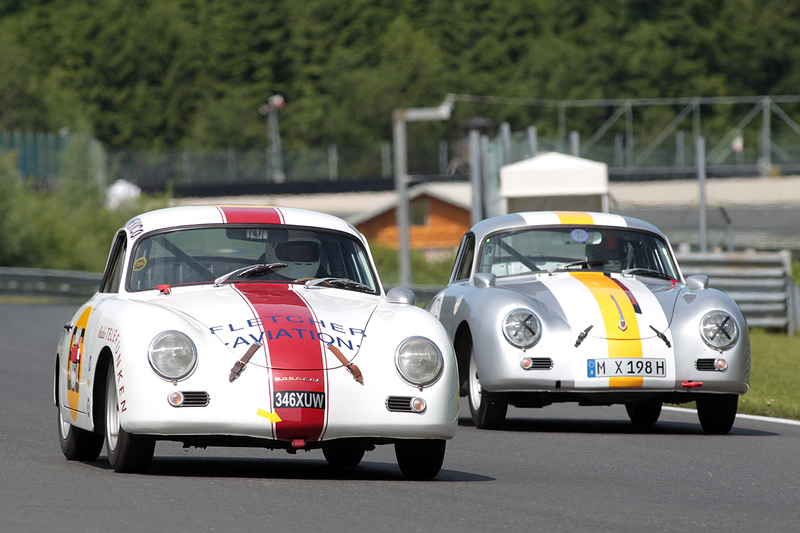 Cant wait until the 356 is sitting beside it!! 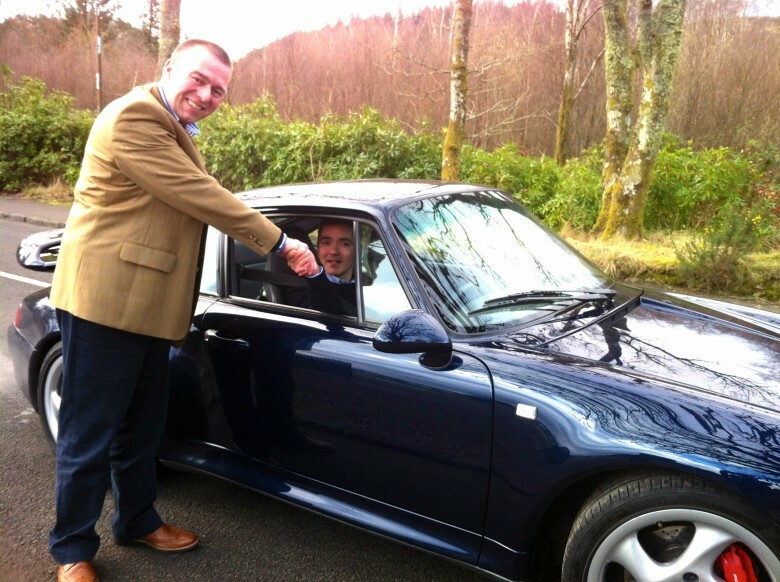 I’m delighted to be the custodian of the Porsche 993 which I got recently from Border Reivers. 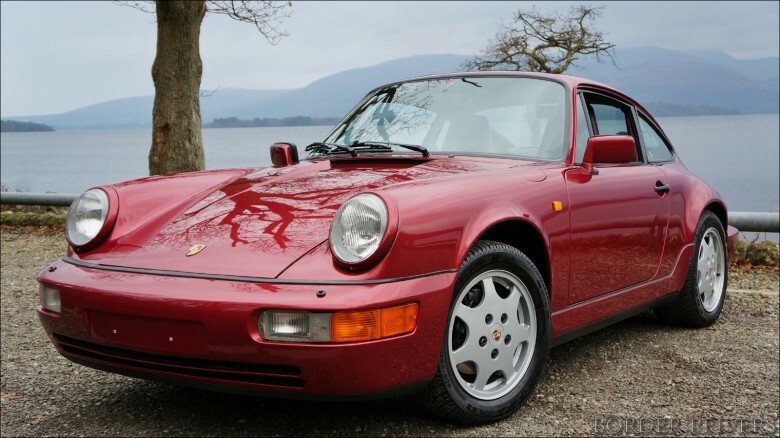 As a buyer, whilst I was excited in getting an iconic sports car I was a bit apprehensive as well to make the right choice for a classic car which is two decades old. It is here you played a crucial professional role in giving me the confidence by providing the right & accurate information about the car and its history. 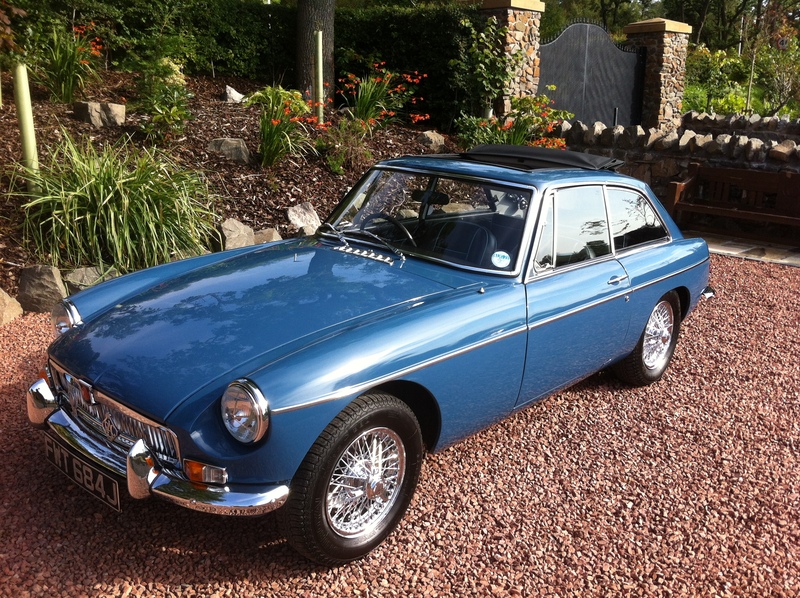 Hence my classic car buying experience (thro Border Reivers) has been smooth and easy and I ended up with a gem of a car which is great and fun to drive. Thanks for your help and continue your good work. 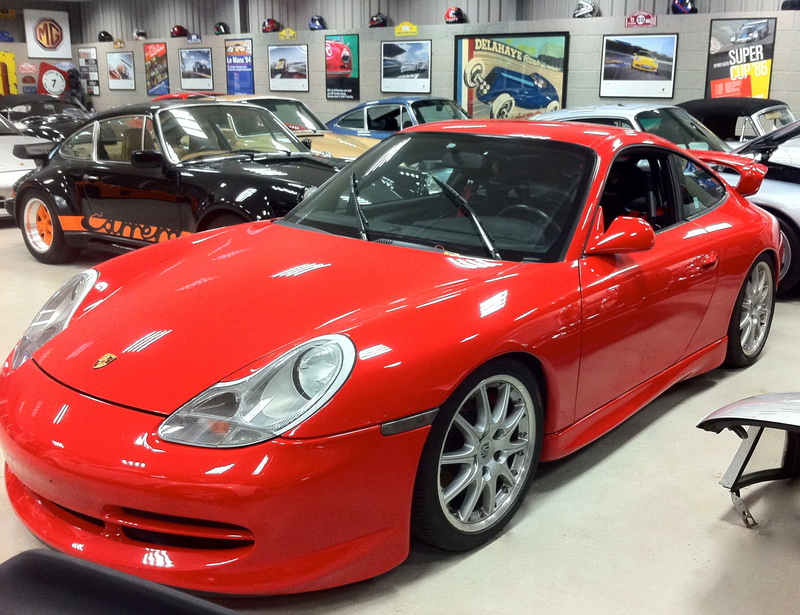 Would like to say thanks for the 996 Turbo you sold me 2 months ago. I have put a 1000 miles on the clock and the car is even better than I ever expected it to be. It took me 8 months to find the right car and I am glad I waited. I felt reassured buying the car from yourself as you have a fantastic set up there and when you’re paying that much money for a car it needs to be right. 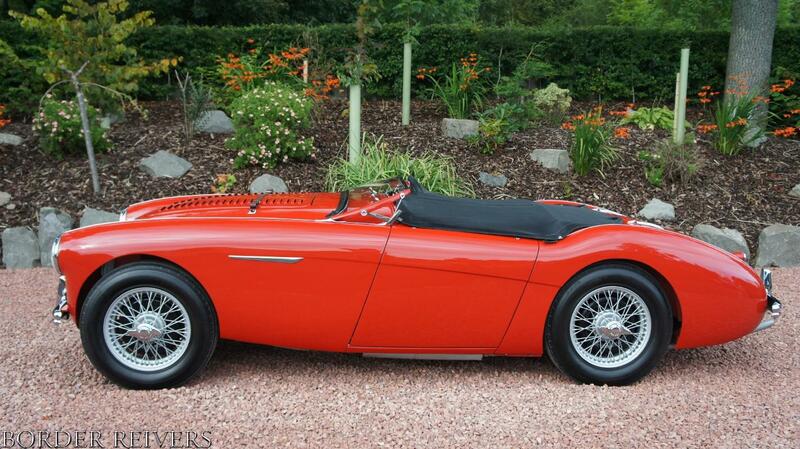 I have just taken delivery of the Daimler SP250 and it is fabulous. The quality of the paintwork and brightwork is absolutely stunning. It is hard to believe that you can achieve that quality of paintwork on a glassfibre body. Your team is to be congratulated. I cannot wait for the next sunny day to take it for a run! Sincere thanks for a job expertly done. A few words to say many thanks for all your help and advice during our first experience of choosing, buying and owning a classic Porsche. 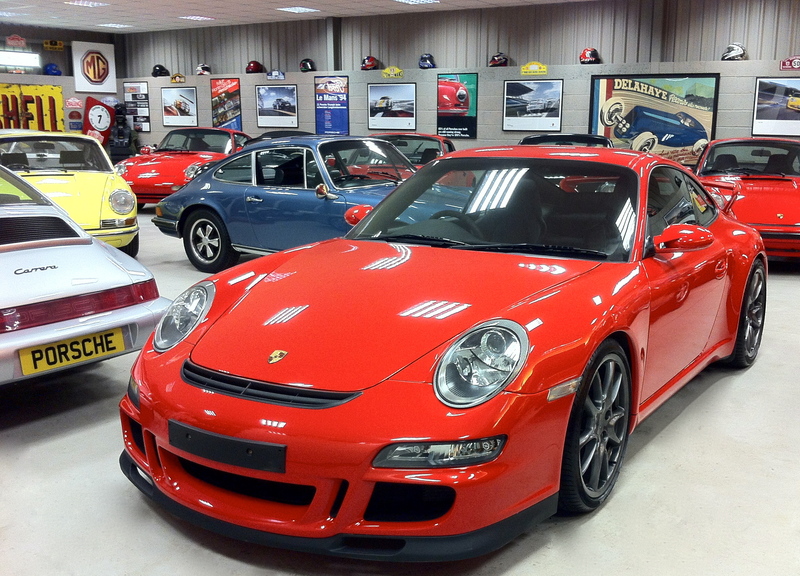 When we walked into the showroom and saw the 1982 911sc it was lust at first sight. Wanting to make sure it was really what I wanted, it was brilliant of you to suggest a few days cooling off period, but at the same time reserving it from sale. The few days passed but there was no cooling off and we did the deal. You then were very helpful in providing safe storage until we sorted out our garaging arrangement; and to cap it all the car, in immaculate condition, was delivered right to the door. Cars of this age will obviously need various technical matters sorting out right from time to time. So many thanks for checking it over then safely transporting the car for its MOT this month. As you know we have been back a few times to look at the selection for sale in the showroom and we have always been made to feel welcome. It’s always like an art collection and we could spend hours there. So there we have it: superb cars in a superb setting, friendly expert advice, no sales pressure, and excellent after sales support and advice. I could also mention the demo drive in the Turbo. My eyebrows still haven’t come down and the young lad is still grinning! 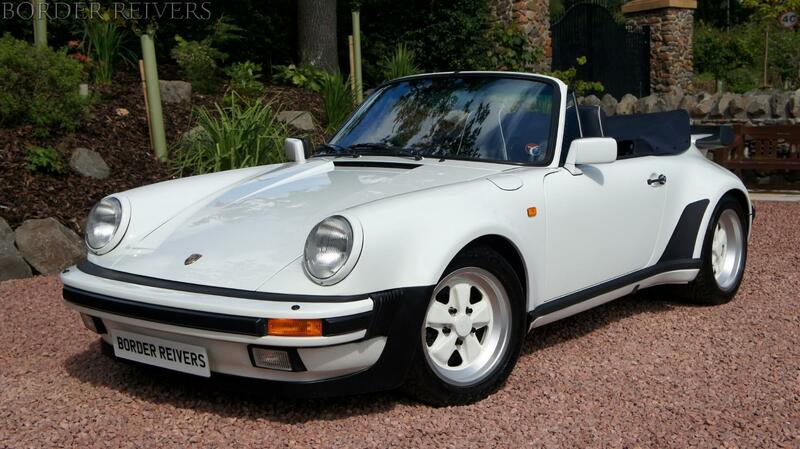 Nostalgia led to my recent acquisition of a late 80’s Porsche 911 Cabriolet from Border Reivers . 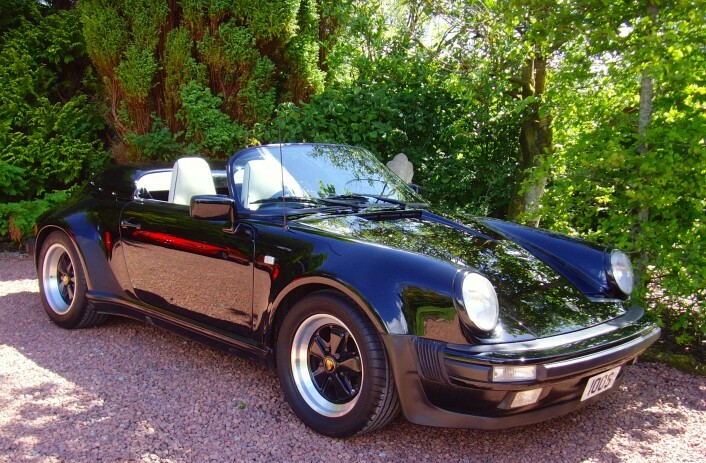 From the early 80’s to the late 90’s I owned 3 white 911 cabriolets in succession, (an SC, Carrera Sport and a Carrera 2) all were my everyday cars and all really great fun. 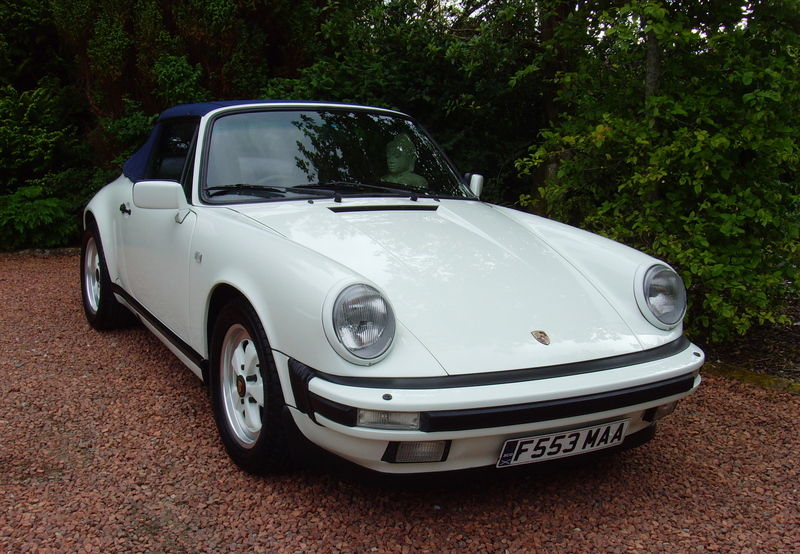 (Last December) from my home abroad, I commenced my search on the internet for a good late 80’s White 911 Cabriolet, I found the one I subsequently bought on the well presented Border Reivers website. The car’s description, fits my requirements. 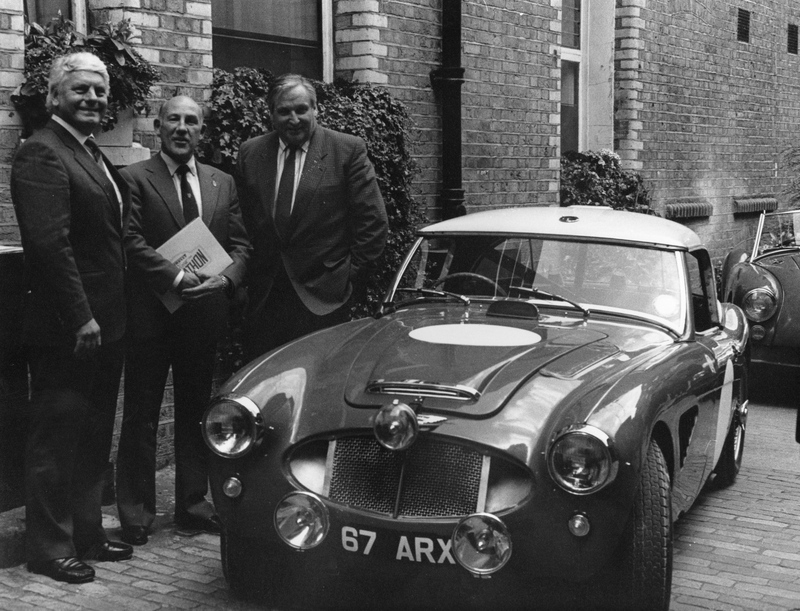 The phone manner of Tom Fitzsimmons mirrored the ethos of the website so I flew to Scotland to view the vehicle. The car was as described, Tom and his crew were very helpful indeed and more than anything it was quite clear to me that cars (not car dealing) are Tom’s passion. I enjoyed the transaction from start to finish. 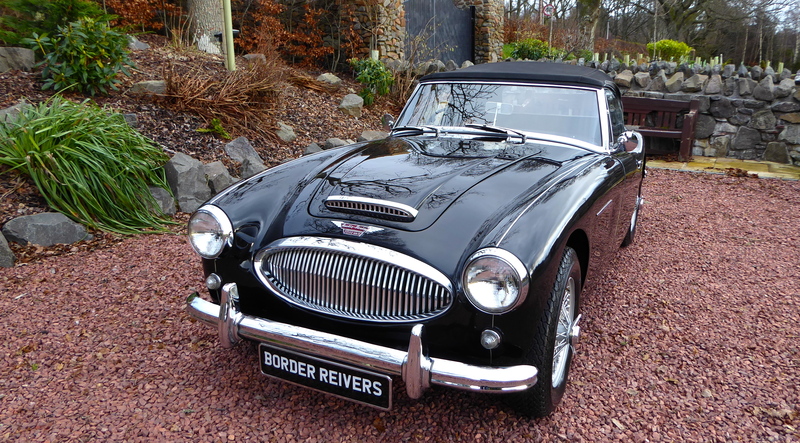 If you seek a classic car and If good old fashioned personal service coupled with contemporary efficiency are important to you, I highly recommend Border Reivers. We are glad to report that our 911 Speedster has arrived safe in New Zealand. 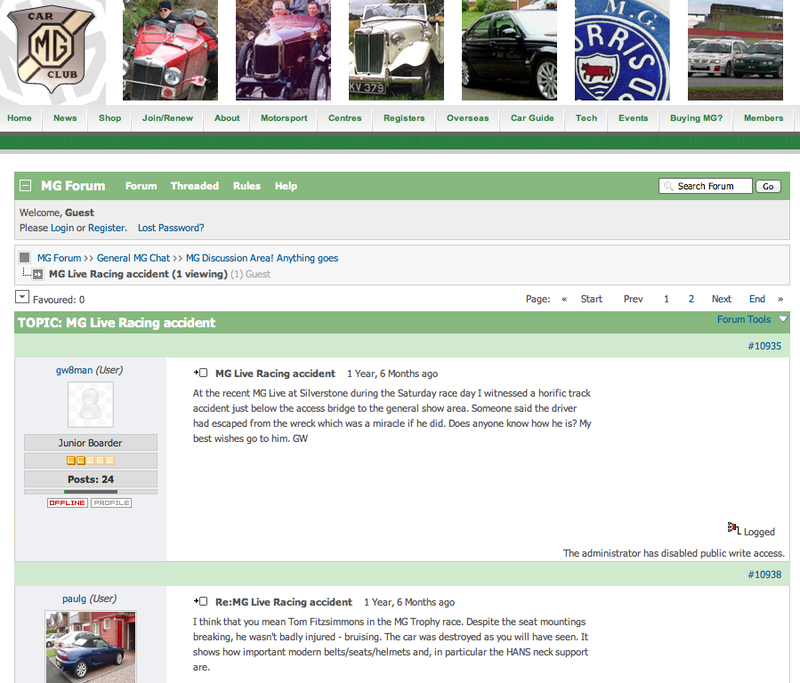 The new owner Mr Mason purchased the car over the phone, which makes us uncomfortable however we have just had a very pleasant e-mail which reads…. Car has arrived safely thanks Sean/Tom. Everything is as described & as expected. Thank you for a great service. 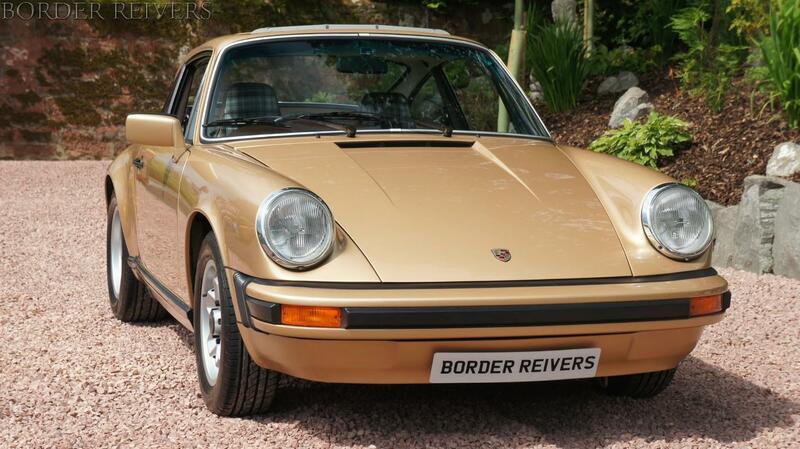 I am truly delighted with the purchase of my Porsche 911 from Border Reivers. Its everything I had been searching for. I originally dismissed this company as I live in Oxford and they are in Scotland but having been let down by so called specialist locally in the London area. I decided to give Border Reivers a call. The friendliness and helpfulness of the receptionist on my initial call (must have been her soft Scottish accent) got me hooked. I was put through to Tom. He listened to what I had to say and ask me what I wanted the car for ( it was like an interrogation ) but he was just trying to get me into a car the suited my needs rather than just sell me a car. 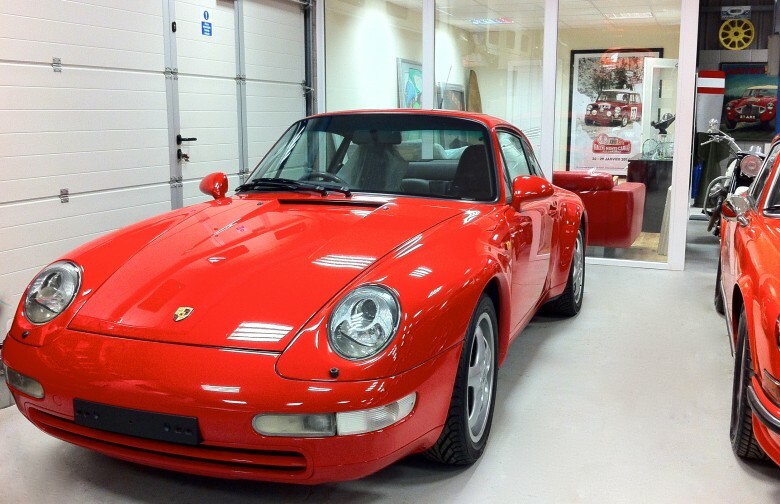 He quickly narrowed it down to a 964 Coupe, he then broke the news he had none in stock ! “What I like about Tom is that there is no a hidden agenda; he won’t try to talk you into a car that benefits him rather than you”. I felt comfortable and left it with Tom. He called me about 2 weeks later & said he had the right car for me, described it over the phone and sent about 100 images of every nook. I purchased the car on Toms recommendation. I had to pay for it in full before delivery but Tom was so confident he said ( if it’s not as I have described, get the driver to load it back on the truck & your money will be returned the same day). The car was delivered covered up inside a covered trailer ! At the exact time agreed, by Big George the driver 8.30am. The car was better than it had been described . Don’t be put off by Border Reivers being in Scotland . The Service provided was the best. A real pleasure to deal with honest enthusiasts. The Speedster arrived safely and is now tucked up cosy. Had a really good look over the car yesterday and it really is superb! I am absolutely delighted with the finished article. Thank you to you and your team for a sensational job. It was a genuine pleasure being able to do business with you. Not just in acquiring what is a flawless and completely original car but dealing with people who are passionate about what they do and the way they do it. I was impressed throughout the process by your thorough, professional and very honourable approach. I look forward to doing business with you again, although I suspect it may be some time as I now own what I believe to be a truly great car and it maybe some time before I decide to change! PS I feel that your world famous catering facilities also deserve a mention! I finally picked the Porsche up from the freight company today (Melbourne, Australia) and it is even more divine in real life! You and your team have done an amazing paint job – I am very grateful for the attention to detail – thank you. The file and books with the car are quite extraordinary. It really makes me feel that this car has been cherished for a very long time. I’ll try to live up to that level of care for the foreseeable future! I’ll send you some pictures when I get it properly registered and out on the open road. 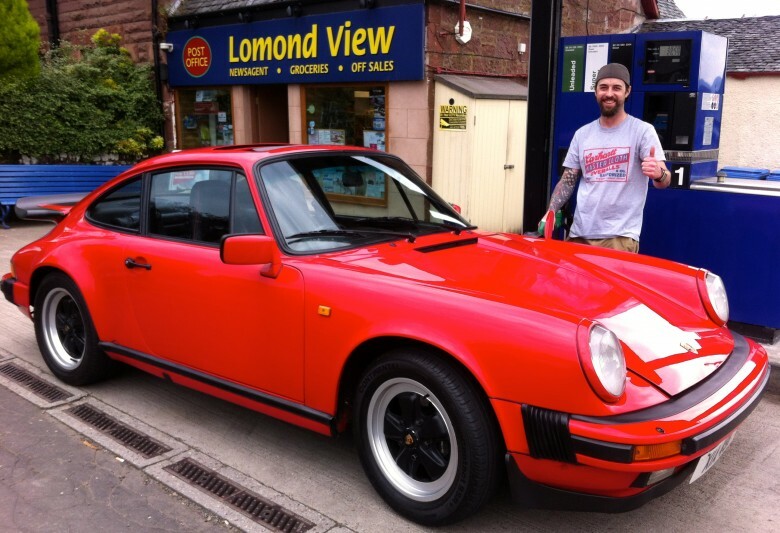 Mr Murdoch (above) gives us the thumbs up after purchasing this beautiful Porsche Carrera 3.2. 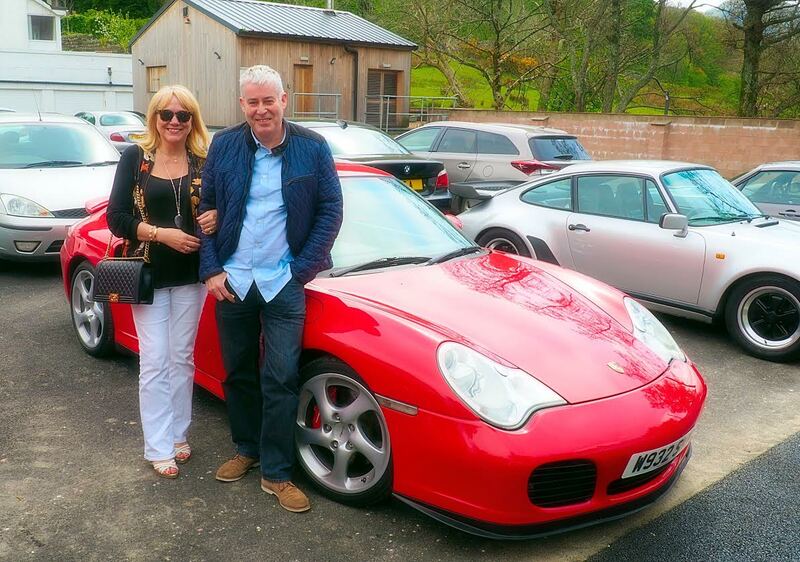 Well, dreams do come true & Mr Murdoch returns to collect his 2nd Porsche from Border Reivers. 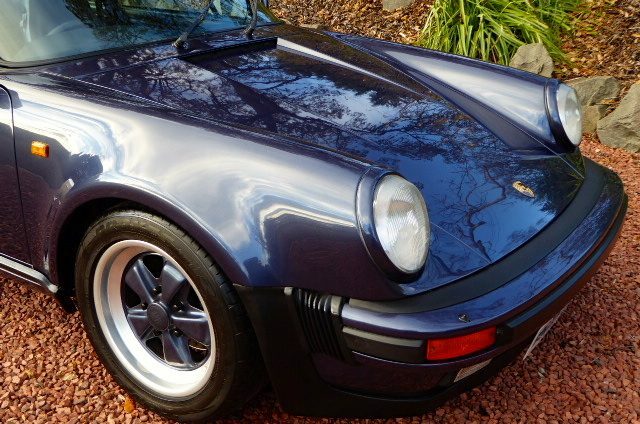 Buying a classic Porsche is all about trust. The reason I have asked Tom to quote me on his web site, is that I would like anyone thinking of buying one of these superb machines to know that with Border Reivers you have a company you can trust 100%. 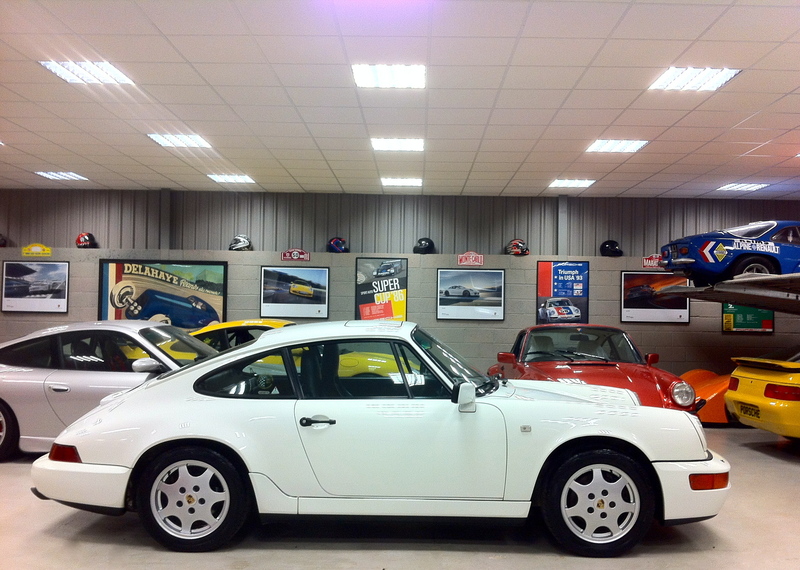 I purchased my beautiful 964 on the strength of Tom’s word that the car was top quality mechanically and cosmetically. To be honest, Tom undersold it – the car is investment quality and totally as described. I live in Cork and the delivery was handled with professionalism and care (covered transporter). In my first mail I’ve written to you, that I must be totally crazy, if I buy a car I ‘ve never seen . I trusted you and that was right! It is really a very beautiful car . It is exactly as described by you. More was not necessary indeed. Buy your car at Border Reivers! Best regards from Austria to Scotland and all the best for you and your team! I was always going to buy myself a classic British sports car when I retired from the Force, the question was which one. I decided on the Triumph TR6 because it was pretty much a middle of the road, reasonably exclusive and desirable car but not so much that you would not want to drive it on modern roads. Good parts and club back up meant the selected car would spend more time on the road than in the garage. 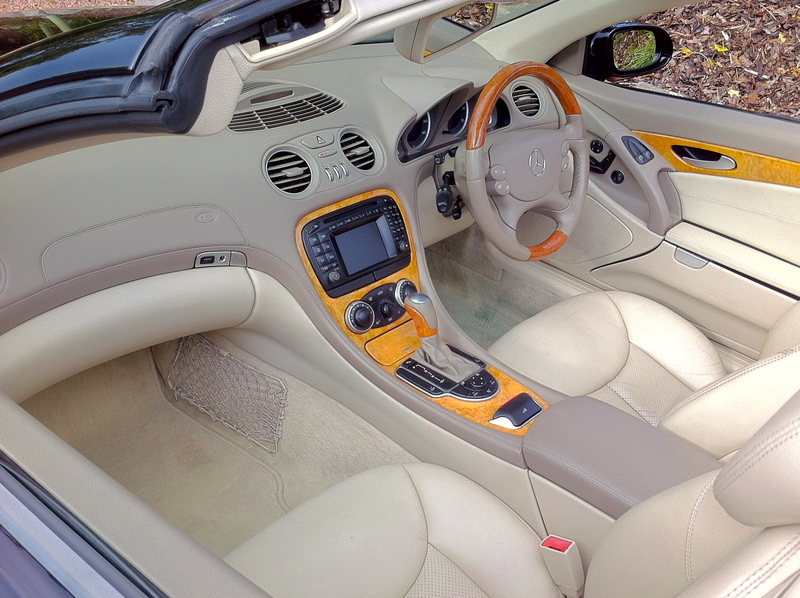 Having selected the type of car the task was find a good example at a reasonable price. To this end I had decide that there was NO way I would buy from a dealer and began to trawl the country looking for ‘the one’ from a private seller and ‘enthusiast’. Whilst I did see several nice cars none of them grabbed me completely, there was always a nagging doubt that the car wasn’t quite as good as I wanted, or the price was not quite right, or god forbid – I didn’t gel with the present keeper! To this end one Saturday in July 2014 I found myself travelling 250 miles to sunny Glasgow to look at one example which unfortunately slipped into the above category. 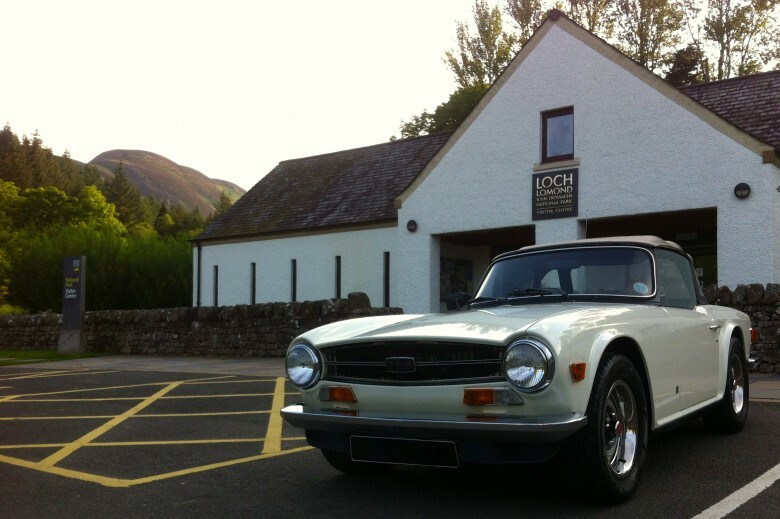 Luckily I recalled an advert I had seen for a white TR6 literally before leaving the house which was also in Glasgow and even though it was a dreaded dealer, so as not to have a completely wasted journey, I gave the guy a ring! Isn’t it great how some times fate throws you a prize, and also a lesson never to prejudge or have preconceptions. A short while later we were met by Tom, who gave us a warm and enthusiastic welcome and gave us a tour of his premises as well as the car that we had come to look at. Tom gave me an ‘enthusiastic’ demonstration of the car and I tootled back. 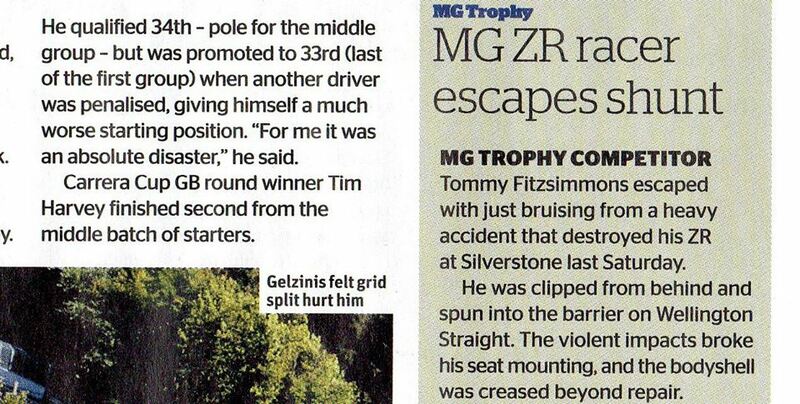 At his insistence my wife then drove whilst I rode shotgun which was unexpected and appreciated… more brownie points! 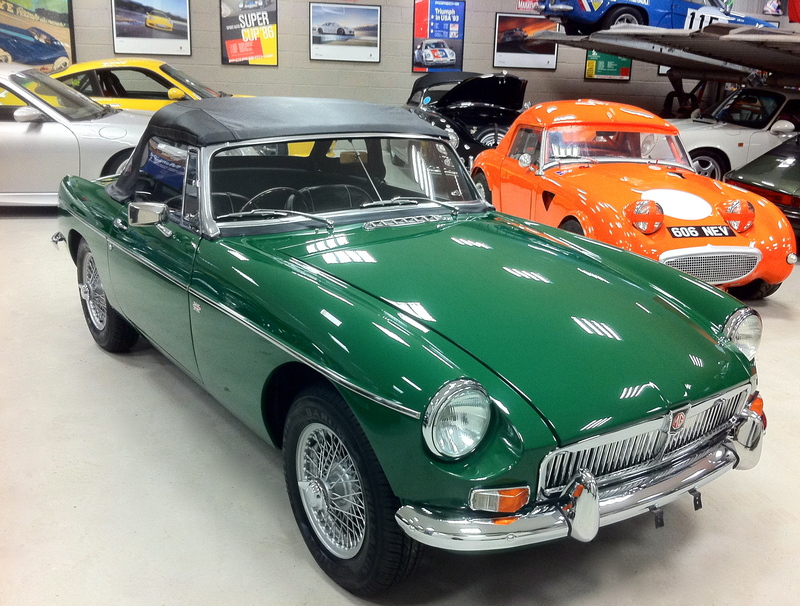 The car was everything I was looking for… not least because my wife instantly fell in love with it. (A fact I desperately tried to conceal from Tom!) And arrangements were made to contact Sean, the person in charge of actually unloading your wallet, at the start of the next week. 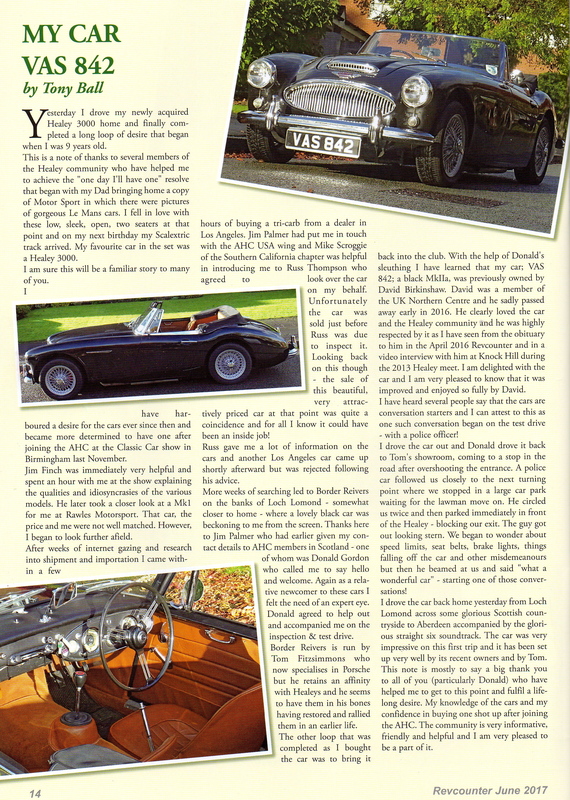 I stand by my statement at the start of this article that I will not buy from dealers, but here’s the rub:- Tom and Sean are not dealers; they are true enthusiast and friends with a shared passion for classic cars. Tom is the temporary guardian of a selection of some truly superb cars waiting for their next home, the owners of which will be vetted before he parts company with them. From our first meeting I felt relaxed and welcomed. Between viewing the car and picking it up I researched the company and Tom, what I found made me feel more like I was becoming part of something and less like I was taking a car away. I cant remember the last time I bought something from any one who looked after me and my wife so well and made us feel truly at ease and comfortable with parting with money for what is essentially a luxury item. My only regret is that in all probability I will not be buying another classic car and as such I will have no reason to deal with Sean and Tom again, though I have no reservation in recommending them to anyone. That said I have promised a selection of photos of the TR6 from around Europe as we tour over the next few years. You will have seen their phrase ‘We only buy cars, we would love to own’, I believe it, you should too. After a stress free flight from Norwich to Glasgow and nearly three years of scouring adds we had finally found a Porsche that looked right at Border Reivers on the banks of Loch Lomond. 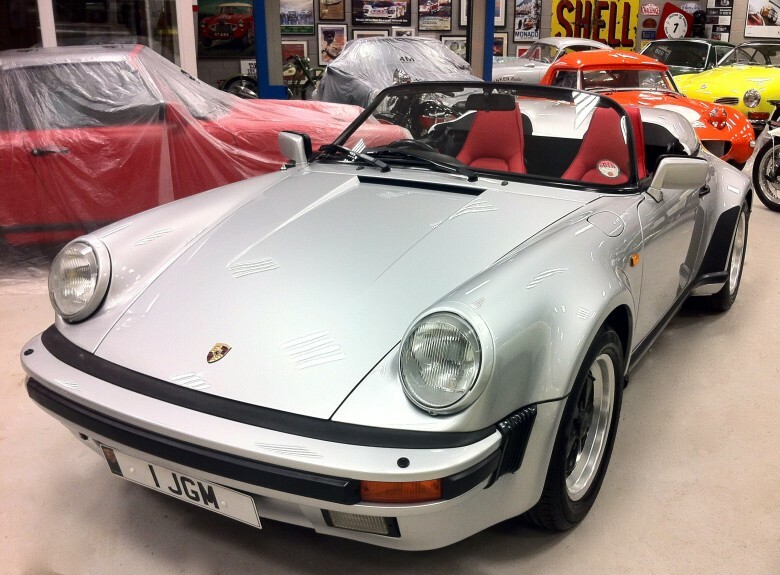 This company run by Tom Fitzsimmons who specialises in Classic Porsches and much more. Tom collected us from the airport and dropped us off at our hotel, where we were staying for a few days in the most beautiful of settings. 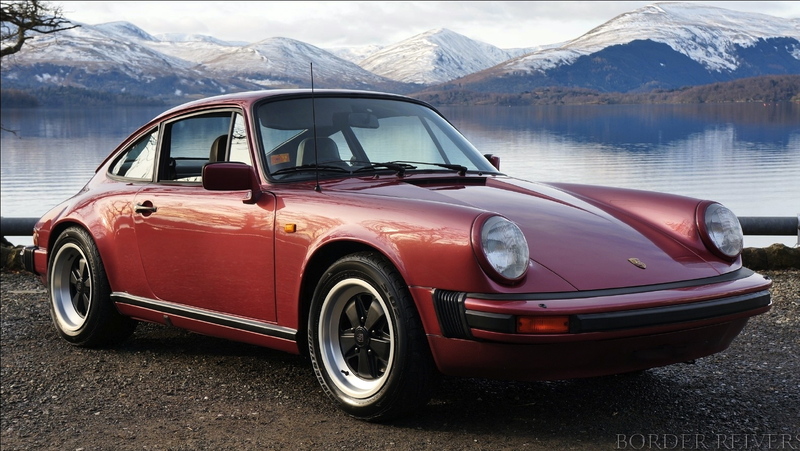 That evening Tom took us to the showroom and we were in awe of his wonderful selection of cars, we saw the 1982 Guards Red 911 SC, how could you miss it. It was everything we had hoped for and more. After taking it out for a breath taking spin with Tom at the wheel we both had a go and it felt superb. I truly could have cried. Our plan was to drive the car back to Norfolk after we had done the deal and this we did. This was our first time driving a classic Porsche and it performed up to expectations and beyond, solid as a rock and what a head turner. 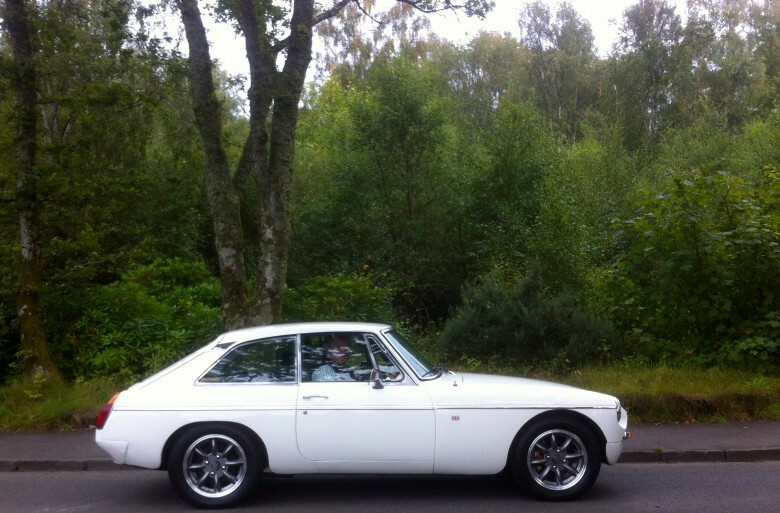 If you are looking for classic car make sure you check out Border Reivers, you will not be disappointed. Hi Tom, we drove back the scenic route via Glenshee and Braemar to Aberdeen. Fantastic Scenery in a fantastic car. I am delighted with it. Thanks for the servicing and detailing & for the time you took with us yesterday. 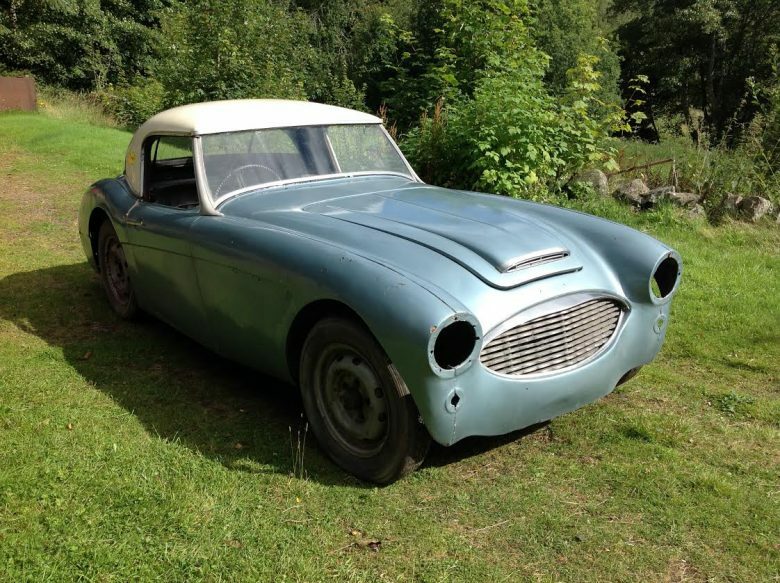 Yesterday I drove my newly acquired Healey 3000 home and finally completed a long loop of desire that began when I was 9 years old. 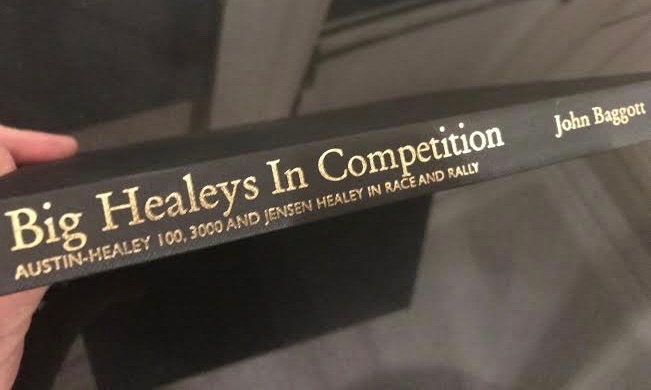 This is a note of thanks to several members of the Healey community who have helped me to achieve the “one day I’ll have one” resolve that began with my Dad bringing home a copy of Motor Sport in which there were pictures of gorgeous Le Mans cars. I fell in love with these low, sleek, open, two seaters at that point and on my next birthday my Scalextric track arrived. 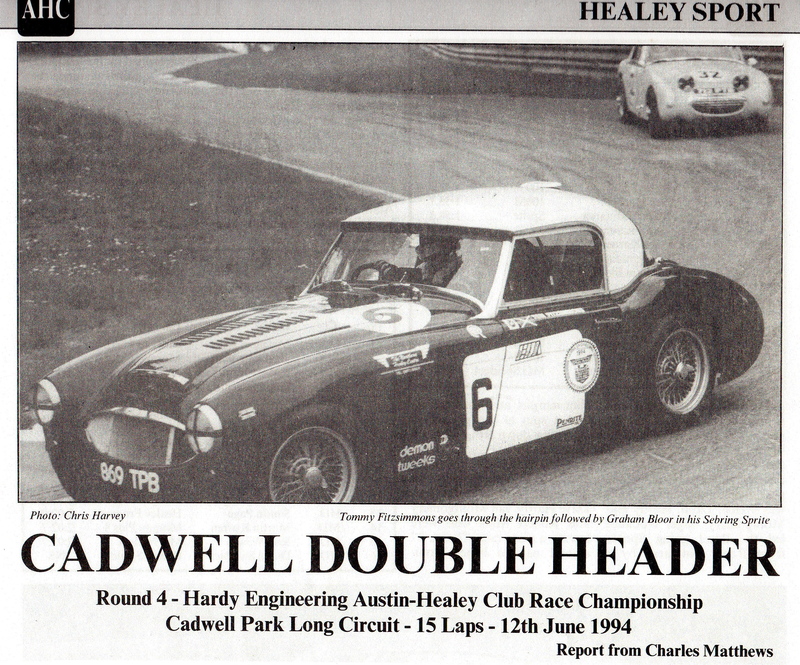 My favourite car in the set was a Healey 3000. I am sure this will be a familiar story to many of you. 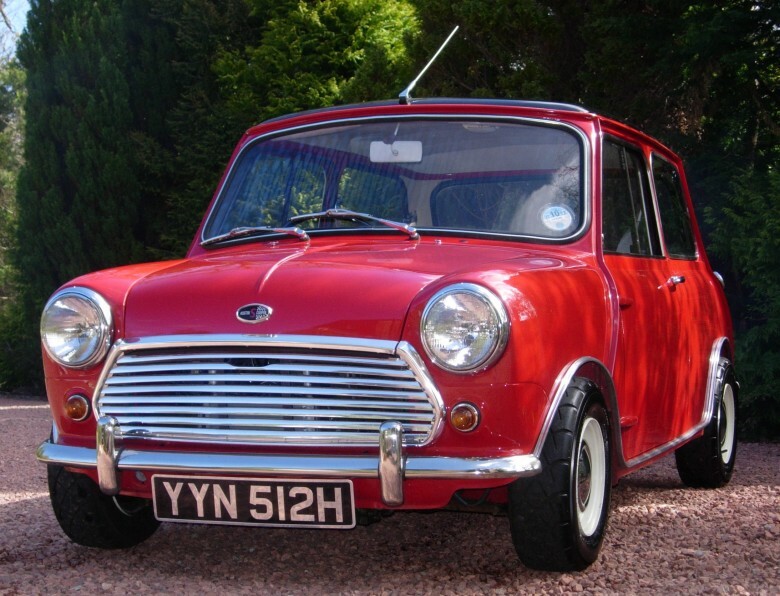 I have harboured a desire for the cars ever since then and became more determined to have one after joining the AHC at the Classic Car show in Birmingham last November. Jim Finch was immediately very helpful and spent an hour with me at the show explaining the qualities and idiosyncrasies of the various models. He later took a closer look at a Mk1 for me at Rawles Motorsport. That car, the price and me were not well matched. However, I began to look further afield. After weeks of internet gazing and research into shipment and importation I came within a few hours of buying a tri-carb from a dealer in Los Angeles. 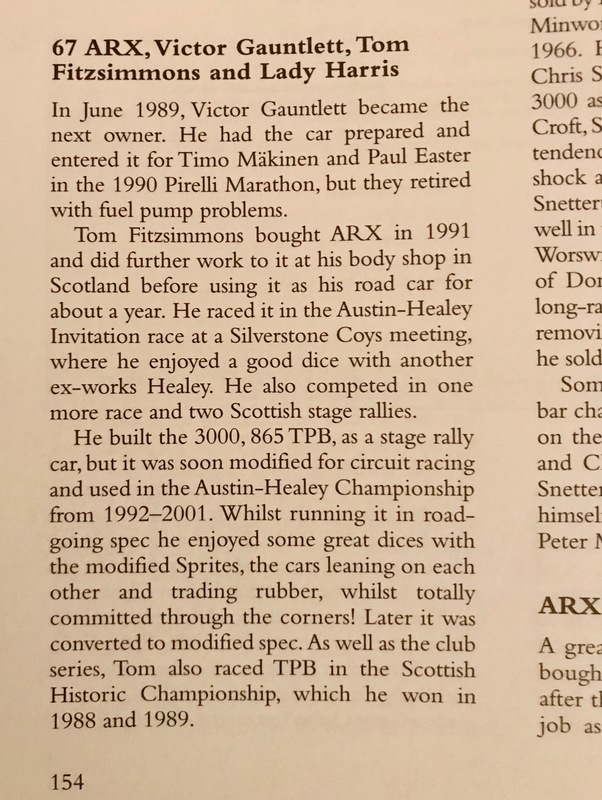 Jim Palmer had put me in touch with the AHC USA wing and Mike Scroggie of the Southern California chapter was helpful in introducing me to Russ Thompson who agreed to look over the car on my behalf. 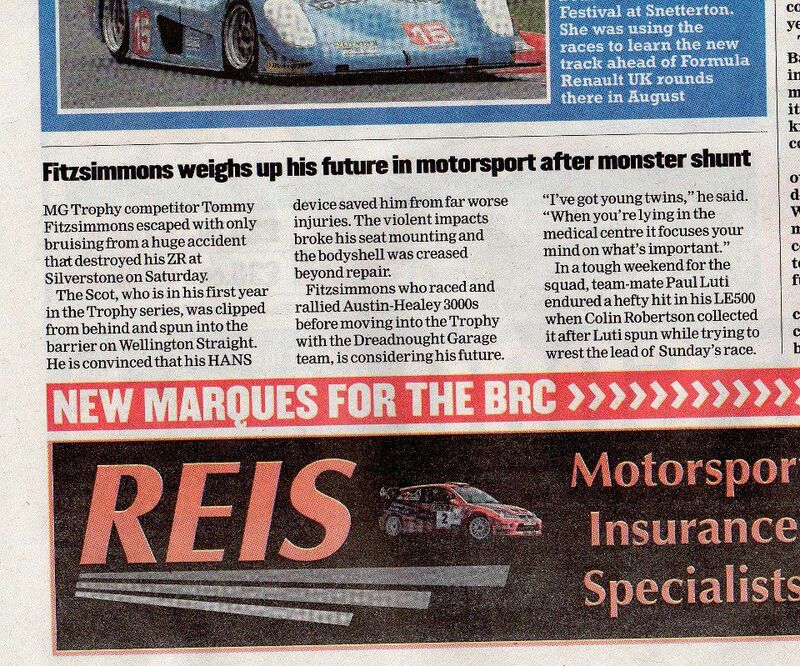 Unfortunately the car was sold just before Russ was due to inspect it. Looking back on this though – the sale of this beautiful, very attractively priced car at that point was quite a coincidence and for all I know it could have been an inside job! 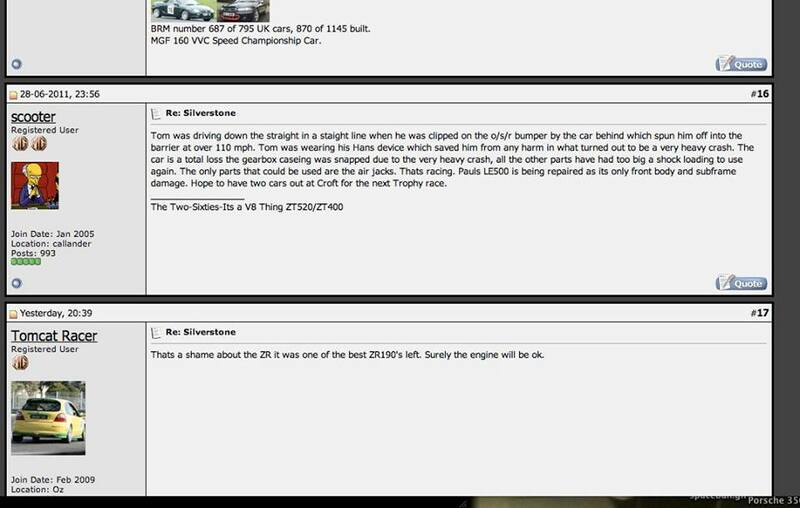 Russ gave me a lot of information on the cars and another Los Angeles car came up shortly afterward but was rejected following his advice. More weeks of searching led to Border Reivers on the banks of Loch Lomond – somewhat closer to home – where a lovely black car was beckoning to me from the screen. 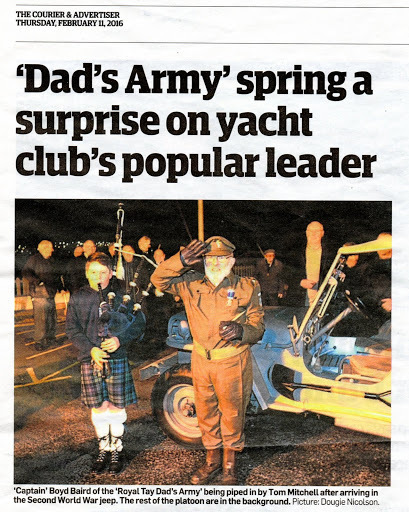 Thanks here to Jim Palmer who had earlier given my contact details to AHC members in Scotland – one of whom was Donald Gordon who called me to say hello and welcome. 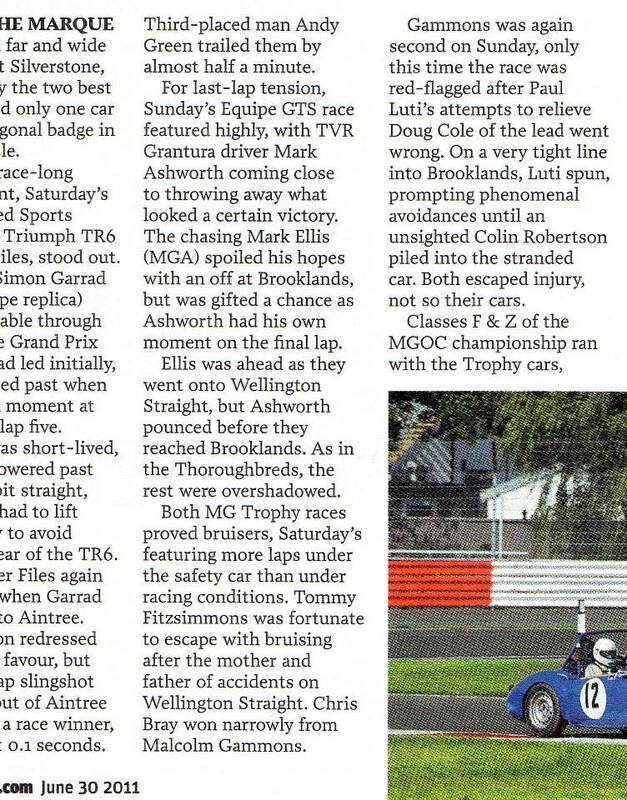 Again as a relative newcomer to these cars I felt the need of an expert eye. Donald agreed to help out and accompanied me on the inspection & test drive. 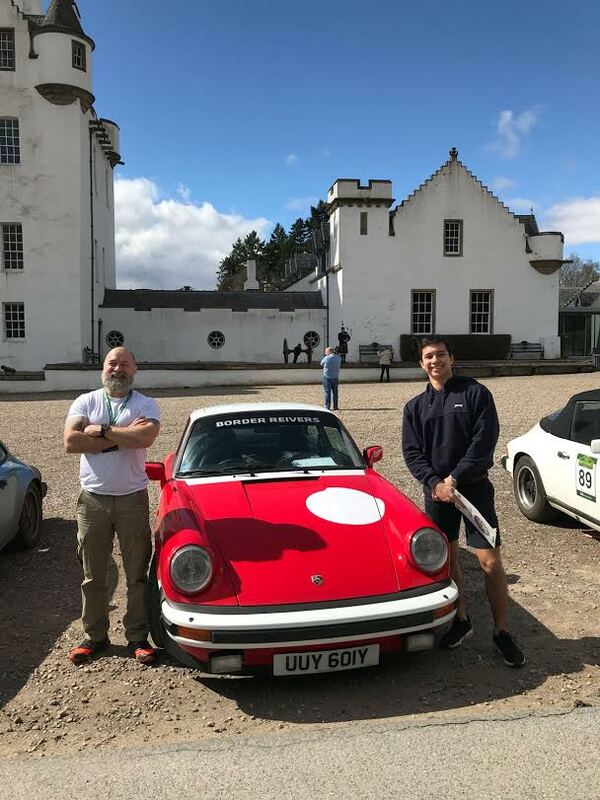 Border Reivers is run by Tom Fitzsimmons who now specialises in Porsche but he retains an affinity with Healeys and he seems to have them in his bones having restored and rallied them in an earlier life. The other loop that was completed as I bought the car was to bring it back into the club. With the help of Donald’s sleuthing I have learned that my car; VAS 842; a black MkIIa, was previously owned by David Birkinshaw. David was a member of the UK Northern Centre and he sadly passed away early in 2016. 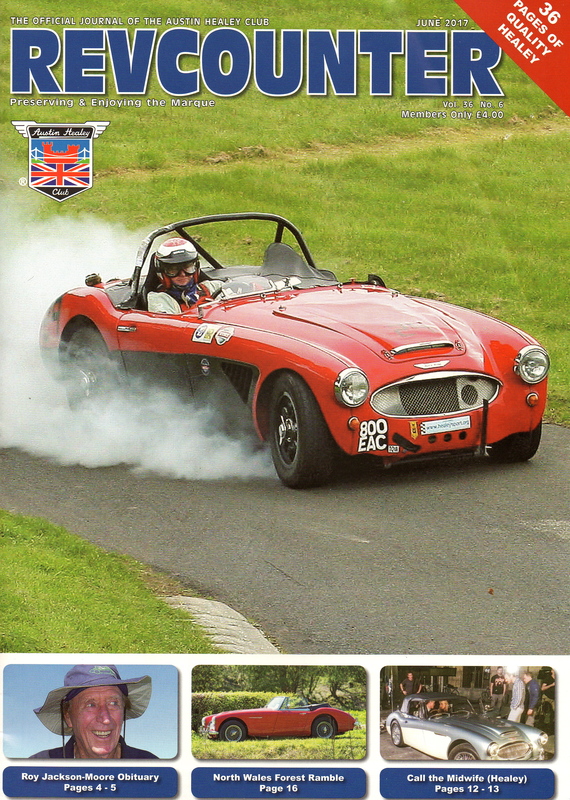 He clearly loved the car and the Healey community and he was highly respected by it as I have seen from the obituary to him in the April 2016 Rev counter and in a video interview with him at Knock Hill during the 2013 Healey meet. 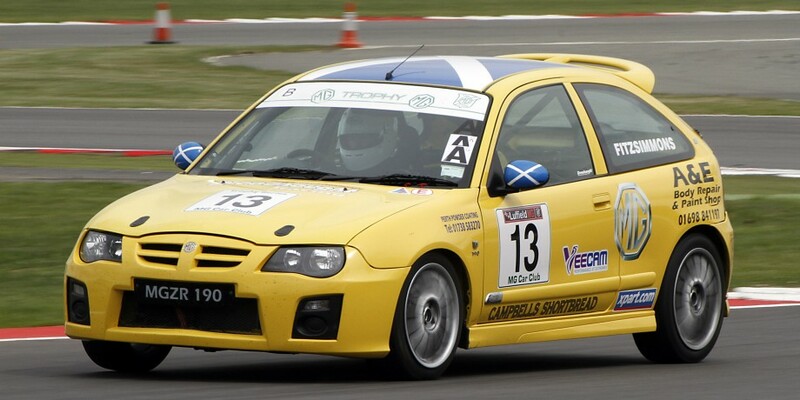 I am delighted with the car and I am very pleased to know that it was improved and enjoyed so fully by David. I have heard several people say that the cars are conversation starters and I can attest to this as one such conversation began on the test drive – with a police officer! I drove the car out and Donald drove it back to Tom’s showroom, coming to a stop in the road after overshooting the entrance. A police car followed us closely to the next turning point where we stopped in a large car park waiting for the lawman move on. He circled us twice and then parked immediately in front of the Healey – blocking our exit. The guy got out looking stern. 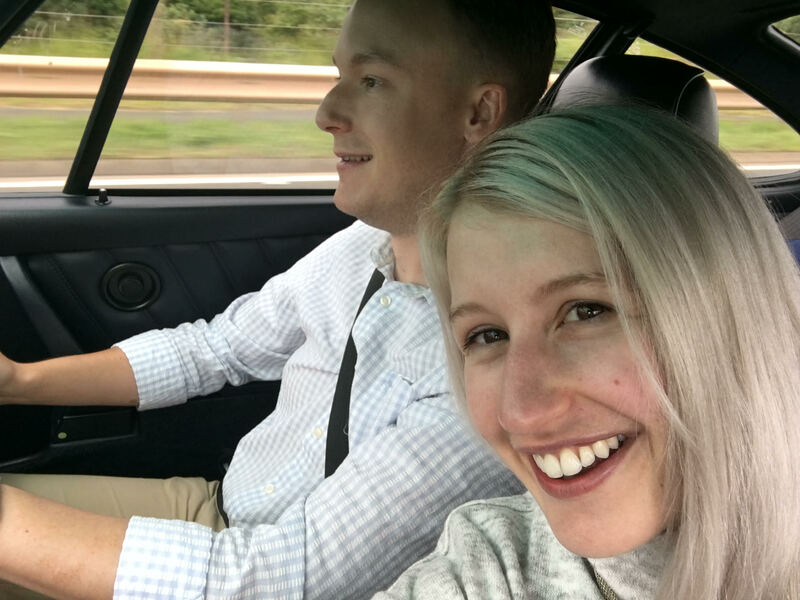 We began to wonder about speed limits, seat belts, brake lights, things falling off the car and other misdemeanours but then he beamed at us and said “what a wonderful car” – starting one of those conversations! I drove the car back home yesterday from Loch Lomond across some glorious Scottish countryside to Aberdeen accompanied by the glorious straight six soundtrack. The car was very impressive on this first trip and it has been set up very well by its recent owners and by Tom. This note is mostly to say a big thank you to all of you (particularly Donald) who have helped me to get to this point and fulfil a lifelong desire. My knowledge of the cars and my confidence in buying one shot up after joining the AHC. The community is very informative, friendly and helpful and I am very pleased to be a part of it. 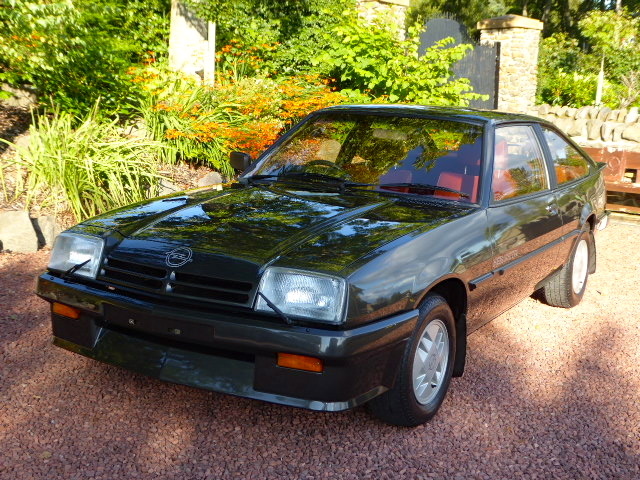 “ Having spent some time looking for my ideal classic car I found an absolutely immaculate Opel Manta 1.8s Berlinetta listed on Border Reivers web pages. A quick e-mail and a viewing / test drive were promptly arranged. Tom met me at his impressive show room, the car was beautifully presented and I was left to look round it while Tom answered any questions I put to him . No pressure and I was also welcome to look at the other classics in stock……all very desirable! A test drive was completed and collection date agreed despite Tom heading off on a family holiday. Transport to collect the car was a little difficult for me but solved when Tom kindly collected me by boat and also laid on a Porsche as transport to the bank to make payment. A very smooth, pleasant, stress free transaction and a car that exceeded expectations and has performed faultlessly. Just to thank you guys once more for another superb job. Excellent craftsmanship, within budget & on time,not much more I can say. Highly recommended. I have just returned from Scotland after a very prolonged 5 day, 350 odd mile test drive in the Mercedes SL 350 and I can only say WOW. The car is a delight , both to drive and to look at. Although it shows 80 K + on the clock it drives like a new car. 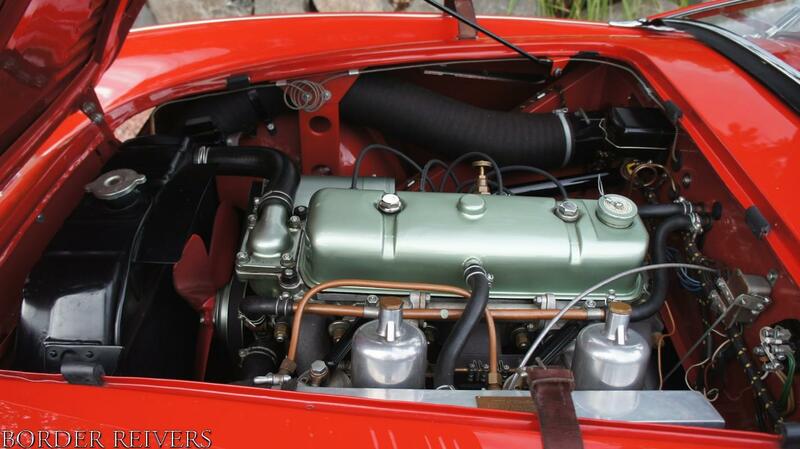 The condition, inside and out is second to none and I look forward to many happy motoring miles and years to come. 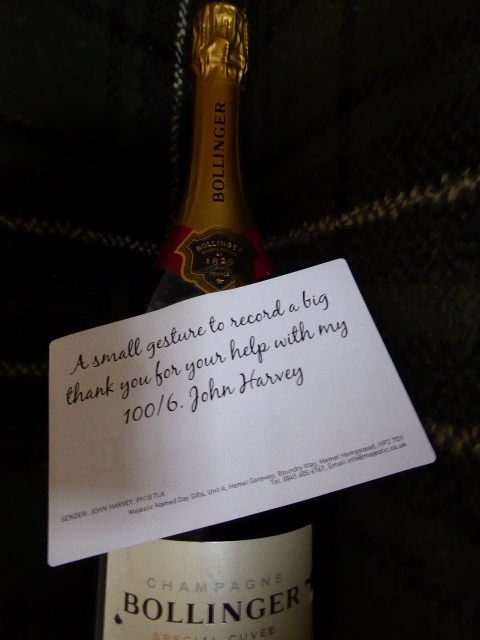 Thank you for making the whole process of the trade seamless. I have no hesitation in recommending Border Reivers to anyone looking for a car, be it a classic or more recent like the SL. Indeed I already did that very thing to a friend I met on the return ferry home. I would just like to thank the chaps at Border Reivers for the safe delivery of my beautiful car. I am delighted to add this testimonial to their page. 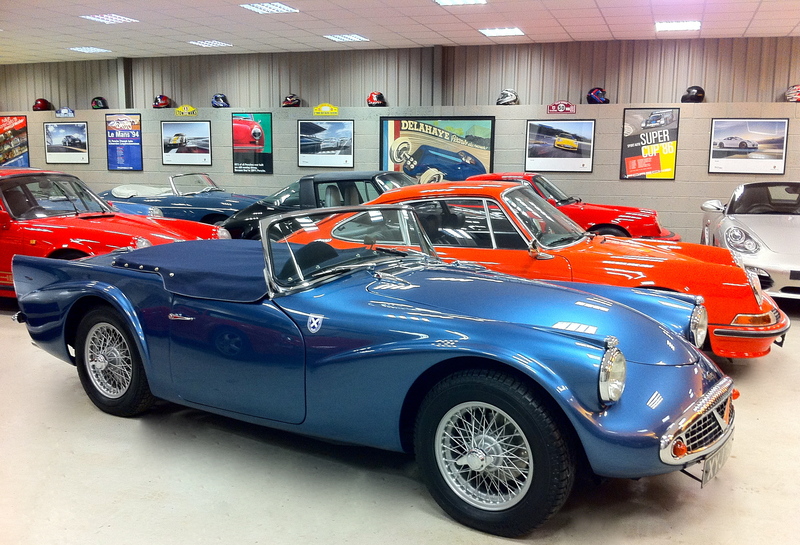 If you are thinking of buying a Classic car, you must visit the Aladdin’s cave on the banks of Loch Lomond. The quality of the Border Reivers cars are outstanding and really have to be seen to be believed. Having both purchased and sold a car through Border Reivers, I am hugely impressed with the quality of product and service offered by this excellent Scottish Company. A powerful and effective blend of passion for wonderful classic vehicles, an eye for excellence, detailing , high quality and professionalism rarely matched elsewhere. Top class is my testimonial. 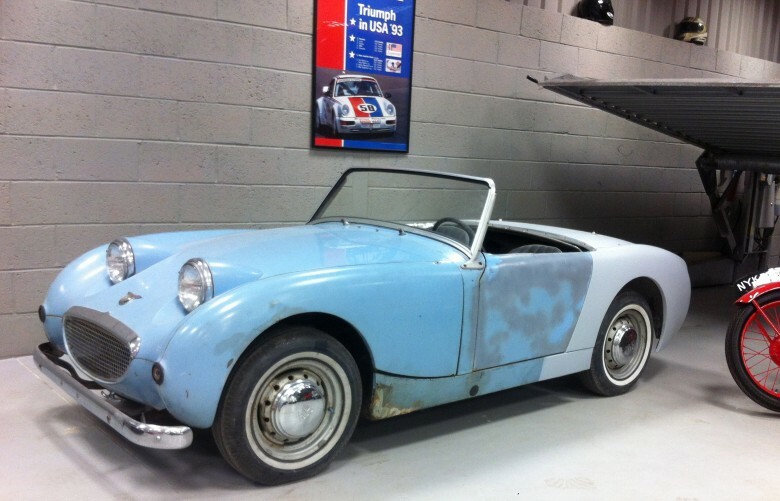 “I recently visited Border Reivers to view and subsequently buy a Frogeye Sprite and would like to thank Tom and Sean for their exceptional customer service and hospitality.Nothing was too much trouble – including meeting me at Glasgow airport! At no time was I under any pressure to buy and I was treated with the utmost professionalism and friendliness throughout. The transportation of the Frogeye from Border Reivers to South Wales was again, not a problem, and the gentlemen who delivered the car were tremendous, keeping me posted throughout! 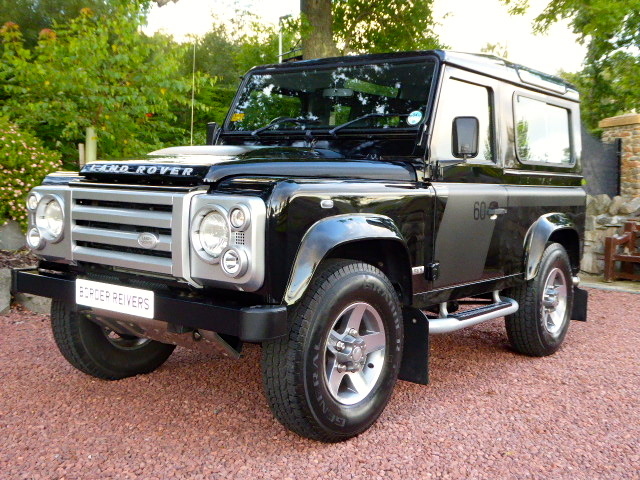 When we first considered selling our under used collector 2009 Defender 90 SVX with 10,000 miles on the odometer used at our home in Stirling, our next door neighbours suggested Border Reivers owing to their very pleasant, successful experience with them in procuring the car they desired. After seeing our Defender, Border Reivers stated a price they thought the vehicle would bring after professional detailing (done at their expense) and we turned our ‘British pride’ over to them to sell. 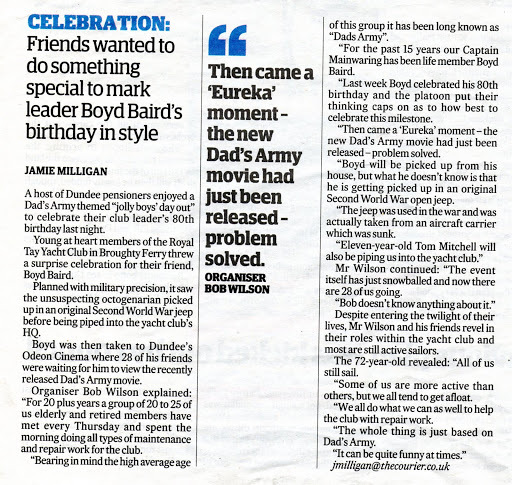 Several weeks later, Border Reivers notified us that the agreed upon funds were wired into our bank account as the Defender has been sold at our agreed-to price. Such a courteous, worry-free, professional and efficient transaction by Border Reivers should make all Scots proud and, gives us great confidence in recommending Border Reivers to others. Tom at Border Reivers, brokered the sale of my MG in a very professional manner. Rescuing me from all the usual stress which can occur while selling cars for yourself. He took care of all enquiries and viewings, keeping me well informed throughout. I was very impressed by the manner in which he conducted his business from the covered transporter collection to the quick sale of my car, all of which was very much appreciated.I won’t have to think twice about contacting him in the future. 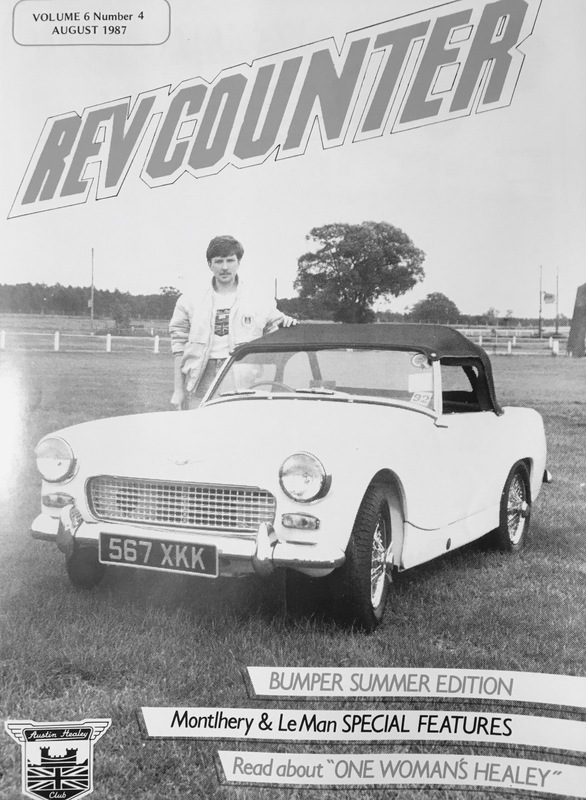 And from 30 years previous a very young Tom on the cover of Rev Counter mopping up at the Concours . Today I would like to introduce you to a good friend and ambassador of EWC. 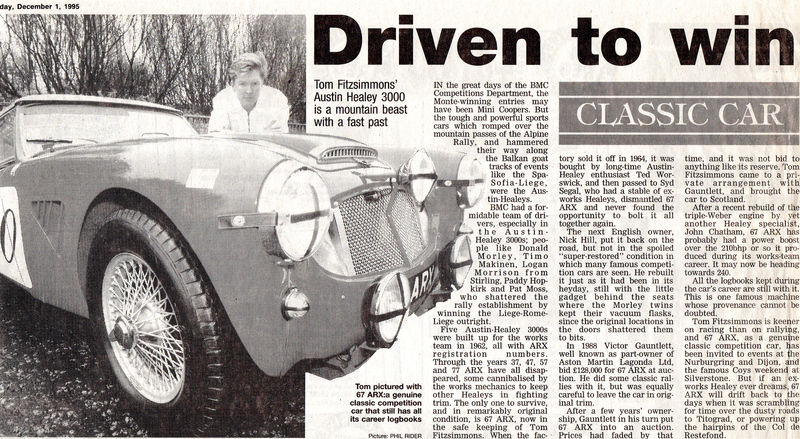 Tom Fitzsimmons (FIMI) is the owner of Border Reivers, a company Tom established following an extensive career in the motor trade and fulfilling his passion for sports cars. 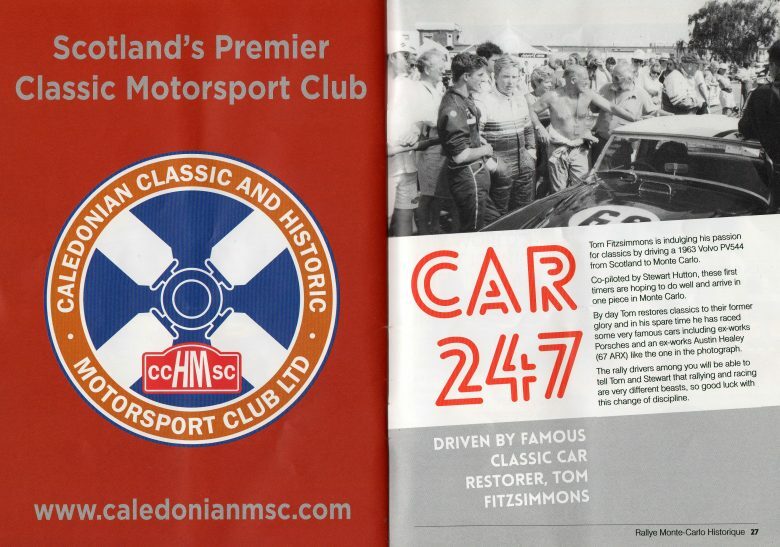 Located on the shores of Loch Lomond this is the home of an outstanding collection of classic sports and race cars each hand picked by Tom based on their condition, history, investment potential and provenance. 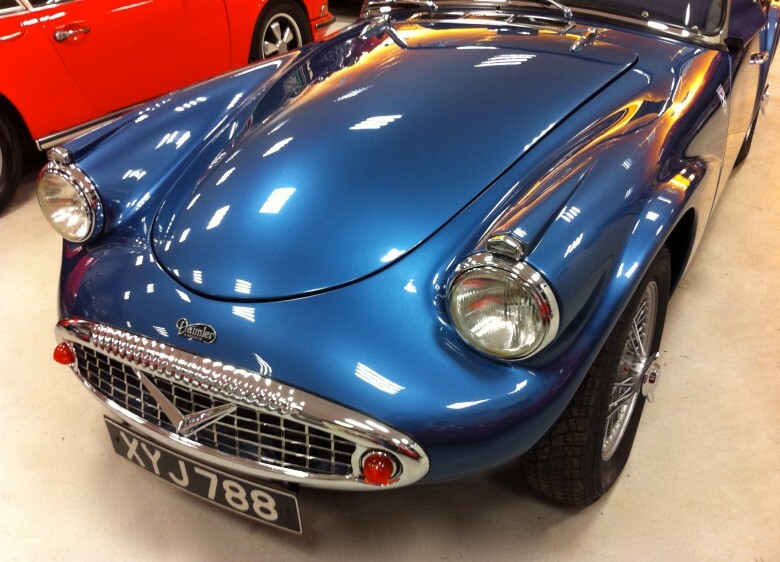 As a small business owner myself I was very interested to learn more about Tom’s business and I was kindly invited to spend an afternoon surrounded by millions of pounds worth of dream cars, some of which I remember having as posters on my wall as a child. 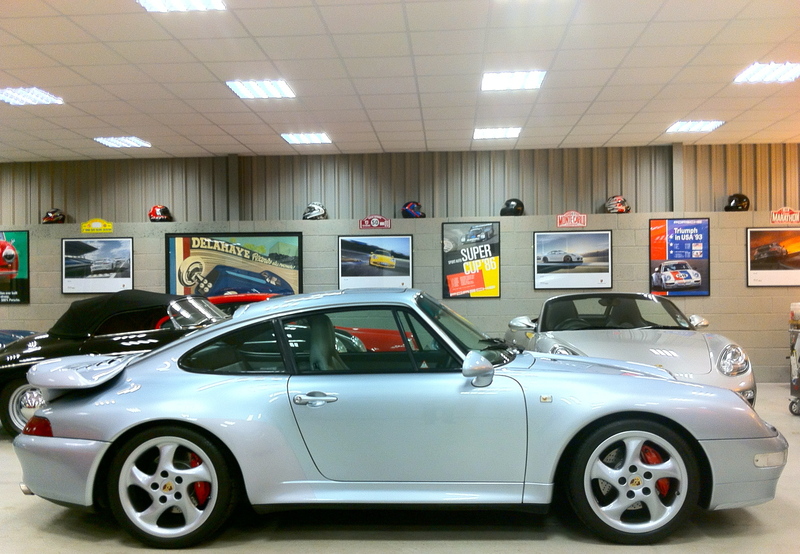 While Tom has a broad range of cars it is the famous Porsche brand that lies in his heart. 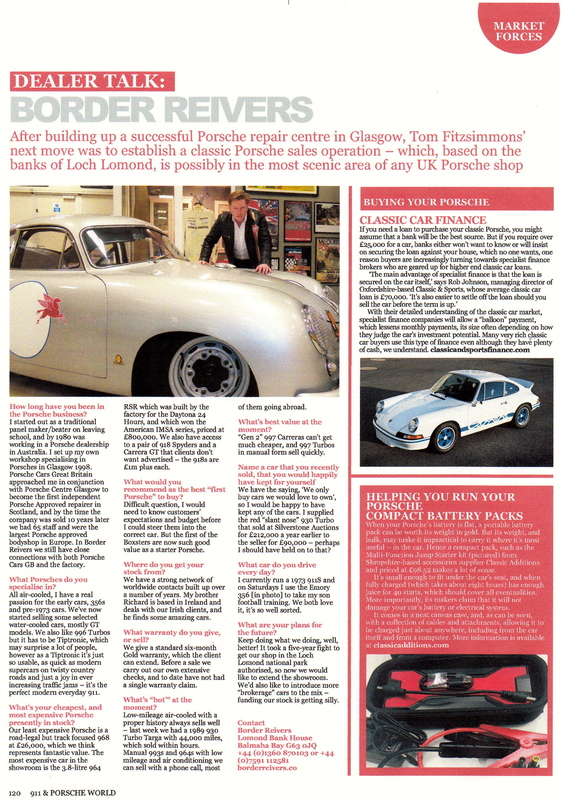 Having being factory trained by Porsche and spent many years running their official bodyshop Tom really knows what to look for and how to restore classic cars to their former glory. By listening to many stories Tom told me about his cars and customers it became clear that we both share a passion for excellence and building valued long term relationships with our customers. You will see from the Border Reivers website that there are a whole range of facilities on offer which include buying, selling, restoration and finance. If you love your cars I would encourage you to take a good look at the website as there are some great photographs, testimonials, an opportunity to get behind the company and you may even spot a few striking EWC watches kindly promoted via Tom’s weekly newsletter. Like myself Tom really enjoys that 1:1 relationship with his customers in order to really understand how he can best assist their requirements, so if you are thinking of an acquiring a classic sports car and have an empty space in your garage awaiting something special Border Reivers is well worth a visit. Purchased from Victor Gauntlett (owner of Aston Martin) by Tom & sold to Lady Harris.